Jerry Girling, Author at AdShots Digital Studio Ltd. I have been working as a retoucher for over fifteen years now. While this may seem like a long time my piano playing goes back much further. It has never been a full time profession for me, but never the less it is one of my passions. If anyone’s interested they can find just a few clips of me on YouTube. A few decades of playing music has taught me a lot about how to improve, make efficient use of learning time, keep an audience engaged and stay motivated. I believe a lot of these principles are universal and I have applied them when retouching. 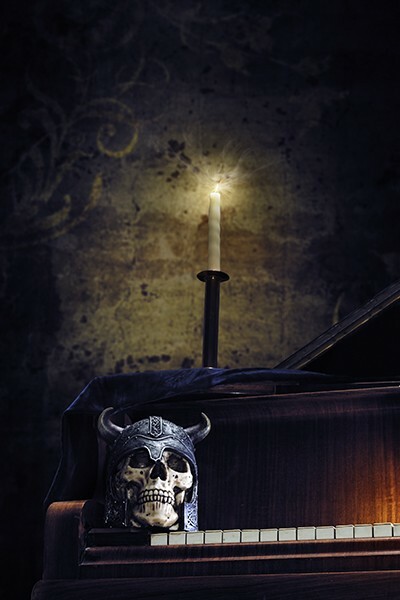 So here are six ideas I use when learning piano and how they are useful in retouching. When learning a piece of music for performance it is there to be judged by an audience. Making the best possible impression is what helps give a piano player a good reputation. Being put under this level of pressure regularly, improves their level of musicianship and gives them confidence. When retouching, your audience is your client. You need regular work or employment as a retoucher, being put under pressure to achieve deadlines while maintaining a high standard. This helps to make you a fast, efficient and confident artist with a reputation for quality and reliability. If a musician only picks up their instrument for a performance they are very unlikely to change their repertoire. Playing the same music will soon get boring for both them and their audience. Previously I worked for a small company as a retoucher where eight hours a day needed to be spent rushing through work, meeting deadlines and answering emails and phone calls. While I recognise that this helped to make me a fast and efficient worker, it also prevented me from expanding my “repertoire”. 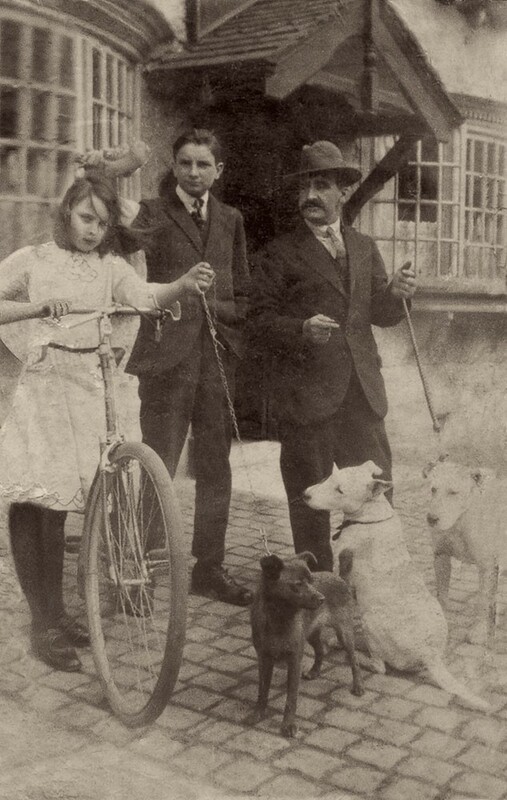 Software updates and new Photoshop plugins meant there were faster and more efficient ways of working. While I may have been aware of some of these new developments I hadn’t had time to become familiar with them and so relied on my out-dated methods through habit. Embrace the Unfamiliar until it isn’t. A common mistake Musicians make is to practice material and styles they are most familiar with. It is far more beneficial if they diversify. This may lead them to exciting new paths to follow or, as is more common it will add depth to their chosen style. In the retouching world diversifying may mean learning several ways to tackle the same problem or learning to use new software. This allows you to choose the best method for any given problem. However, this doesn’t truly become a choice until the new method is as familiar as the old. A piano player may sit at home and run through a piece of music they want to learn. They may go through it several times and memorise it. The moment comes when they get a chance to play infront of an audience and prove themselves. They get several bars in and what’s sounded great in rehearsal is suddenly full of mistakes. Stage fright plays a large part here, but I’d like to focus on another reason for this happening. When learning something new it is common for a pianist to run over the same music several times until they can play it without mistakes. This seems perfectly logical until we take a closer look and analyse what they have done. Very often they have played the music badly dozens of times and only got it right the last one or two times. It’s no surprise that mistakes are made as these have become the stronger habit. Therefore repetition is vital, but it is more repetition than most expect. Retouchers who are just starting out may follow a video tutorial step by step and then feel they can offer what they have learnt as a service to clients. Often what separates amateurs from professionals, is that the professionals have repeated certain methods thousands of times, until they have become second nature. When put under the pressure of time constraints on a job, retouchers can’t be referring to online tutorials. So, if you want to offer a new service that you are unfamiliar with by all means follow online tutorials, there are a lot of great ones out there. Go over them several times then try to copy the methods without referring back to the tutorials and do that several times. Music follows certain rules and structures. When these are understood the learning process is quicker, easier to memorise and gives an idea of possible alternatives vital to developing an individual style. For retouchers, seeing the logic in what they are doing allows for adaptation of ideas to suit different circumstances. Also when following online tutorials it makes the learning process quicker. Don’t ever just follow a sequence of steps blindly. Make sure you understand what you are doing and why. A good tutorial should explain this. There’s a quote from the great jazz pianist, Bill Evans, “I practice the minimum”. I remember this one because on first reading it seemed very unusual to me. This line was a response to the question “What do you practice?” rather than how much. The point being made here is that a musician should concentrate their efforts on learning fewer musical ideas over a given period of time. This gives a deeper understanding and results in ideas being retained in the memory more permanently, rather than being learnt one week and forgotten the next. This is very good advice when learning anything. In the context of image manipulation software such as Photoshop there seems to be an almost limitless amount of ideas on how to use it. The temptation is to move quickly through as many ideas as possible without fully understanding any of them. So yes, diversify, but be patient, take it at a pace that allows ideas to be fully absorbed. In the busy world we work in it may seem counter intuitive to slow the rate of learning, but it is a real time saver if you don’t have to keep referring to tutorials to jog your memory. There may seem to be a conflict of ideas in this post. As a retoucher, should you specialise or diversify? The majority of retouchers are capable of achieving very good results in a variety of styles and are unlikely to turn down what work comes their way. A few are lucky and fit into a niche often working with a few select photographers over a long period of time. I believe the truly exceptional work comes from those that have developed their own individual style within that niche, often as a collaboration with the photographer. I have observed some very talented retouchers working very much on the artistic side of things within their niche. One thing that is very striking is, they often can’t answer questions about using alternative methods. This is because they have developed a personal style over the years and focused their attention very much within that style. The path that leads to this has to come from an understanding of many different ways of working. After all, you can’t narrow your focus if you already have a narrow focus to start with. The art of choosing good photo retouching samples. There is a definite art in choosing good photo retouching samples. Making the right choice lessens the retoucher’s workload, whereas the wrong choice can mean hours of unnecessary work with less than ideal results at the end of it. Light direction and quality need to be taken into consideration as well as viewing angle, perspective and sometimes reflective qualities. Experimenting with a certain amount of trial and error can be beneficial. This is where a Photoshop file with well labelled paths and layers can allow you to quickly try different retouching samples. My free skies for retouching help with both direction and quality of light. Having a large selection of viable skies will help you to choose which ones suit or enhance the composition of the shot. 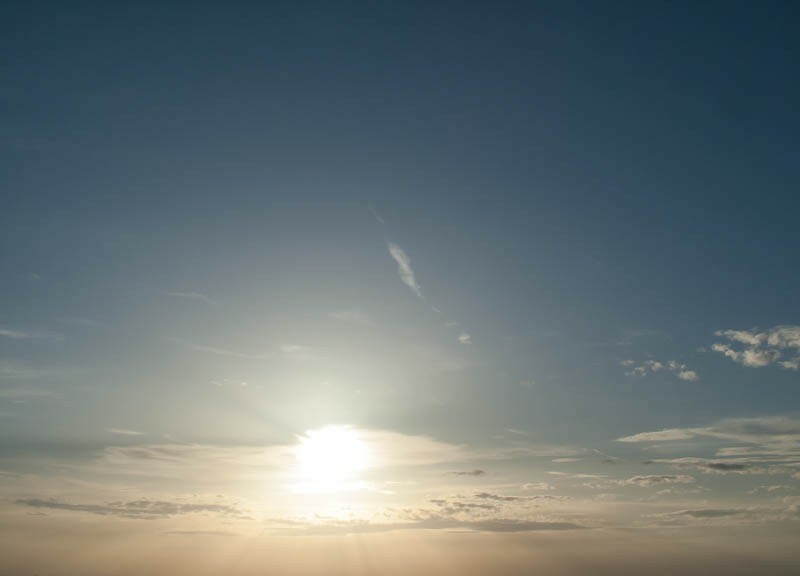 I recently took a series of clear blue skies, available on my “Freebies” tab through July 2015. Interesting cloud formations and sunsets are often good images before even being added to a shot, but sometimes it’s the less obvious skies that sit just right in some shots. So here are a few ideas on how I may use some of these skies in my retouching. There is a certain amount of personal preference involved. You may choose to have a few clouds in this shot, but the idea of keeping the shot simple makes it stronger in my opinion. The large cloud at the top of this image fills what would otherwise be an empty space and the smaller clouds roughly follow the line of houses, enhancing the overall composition. As a retoucher it is useful to work as part of a team with Photographers and design agencies. If a shot is needed for a magazine cover or as part of a page layout other compositional elements need to be taken into consideration. Note how the above image has the front of the building in shadow indicating that the sun is on the left hand side. The added sky was taken in the morning, facing south east with the sun also just off to the left indicated by a lighter shade on this side. 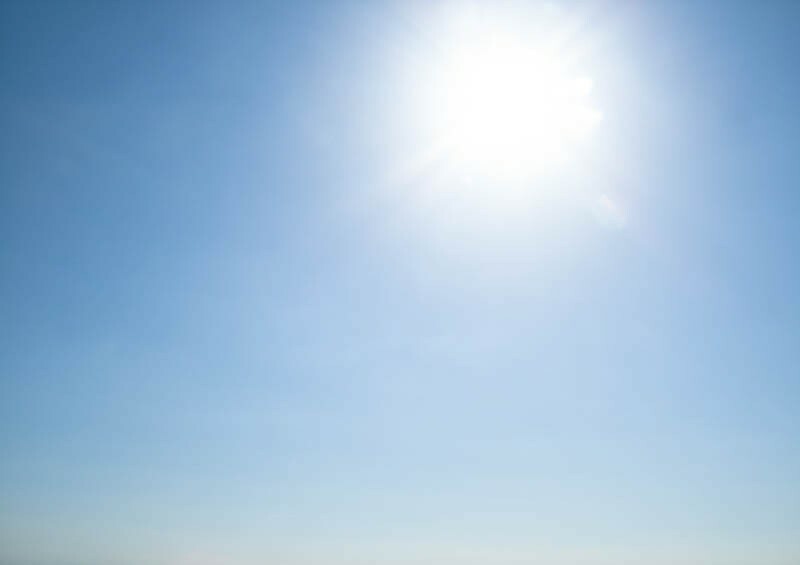 Clear blue sky facing the sun. The reason this may be such a useful retouching sample is because it’s often the shots taken facing the sun that need rescuing. The choice is to either expose for the sky and have the subject matter in deep shadow, or expose for the subject and have the sky completely burnt out. My rule for adding skies to this type of shot is to not make the sky perfect as this will look unrealistic. Original shot facing the sun. Cityscape with morning sky added. Other uses for a burnt out sky may be when retouching interior shots. 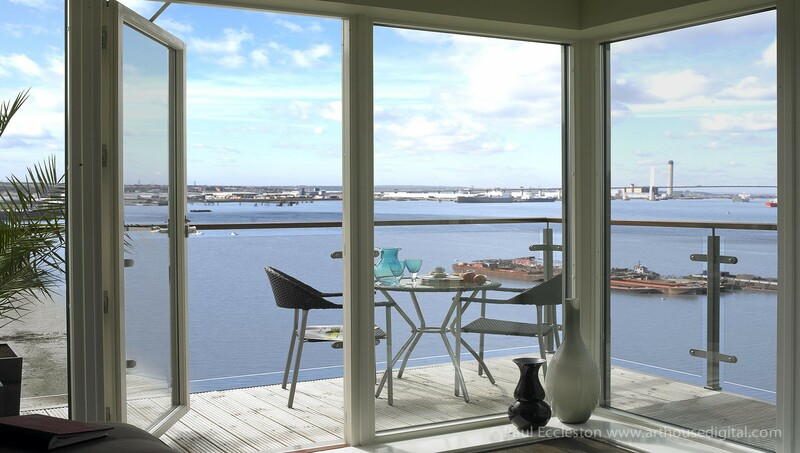 If there is a window view it is common for the exterior daylight to be brighter than the internal lighting depending on how sunny the day is and what photographic lighting is used. Again a stronger sky would look out of place here. 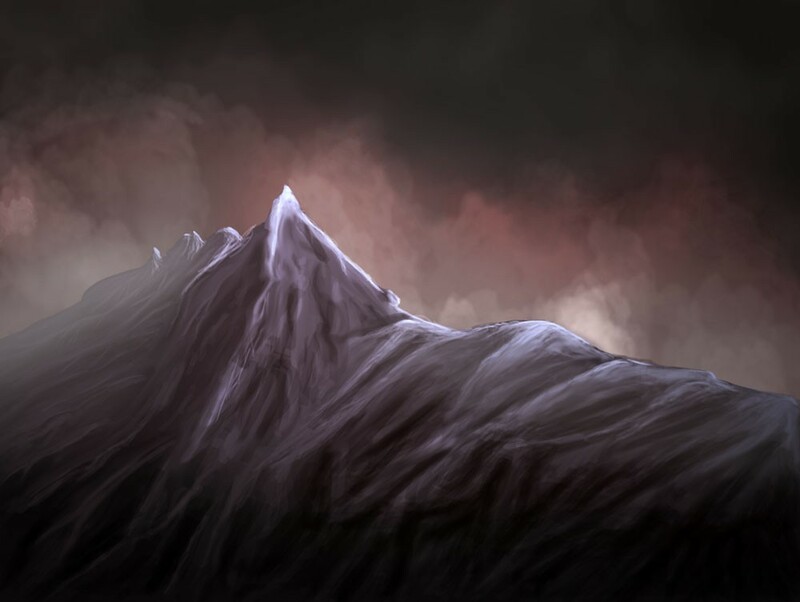 Also it’s surprisingly difficult to make a darker sky fit by lightening it. Particularly it is difficult to artificially achieve the natural graduation seen in the above example. The underlying message when adding skies, or doing any type of compositional retouching, is to keep focused on the final result. I’m often tempted to add skies that look fantastic on their own. Sometimes they work well, but they can also be detrimental to the final result. I hope you have found this blog useful. If you have any thoughts on how to use sky samples in retouching please feel free to share them in the comments box. Remember to regularly visit the “Freebies” tab for new skies and if you wish, subscribe to receive notification when new samples are available. Colour Consistency – was it more achievable before digital photography? A lot of problems occur in colour consistency these days due to misunderstanding of calibration, use of colour space and conversion between colour spaces. I have often heard photographers comment that analogue methods of film and print were a lot more reliable for showing how the colours of an image should be represented. A photograph or transparency will not change colour, whereas a digital image may look different depending on what monitor or device it is viewed on. As someone who worked in a darkroom dealing with professional photographers early in my career I can definitely say that the above argument is not completely true. Colour calibration problems with accurate viewing of colours has always been there in one form or another, whether dealing with film and print or digital images. These include film, paper and chemicals and form a solid foundation if high quality is needed. Possible areas where quality may drop is if film or paper is old or not correctly stored, making sure chemicals are adequately replenished and making sure working areas are as close to 100% light-tight as possible. 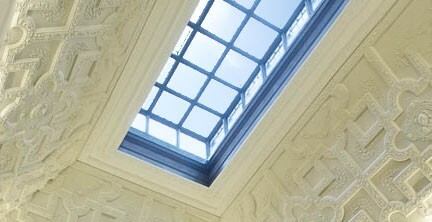 Small amounts of light will not always cause obvious fogging, but will reduce the punchiness of the final result. The use of a densitometer will highlight problems caused by chemicals before they become visually obvious and help in maintaining colour consistency. I used to operate a densitometer to maintain quality on an E6 processor. It involved taking readings from a test film strip, plotting a graph and sending the results off for analysis. It is important to make colour judgements for prints or transparencies based on consistent viewing conditions and a neutral light source. This means looking at prints under daylight bulbs or daylight fluorescent tubes. The colour temperature of fluorescent tubes changes as they get older, so they will need to be replaced regularly. Transparencies need to be viewed on a lightbox with a neutral colour source. If transparencies need to be matched up to prints a special viewing hood is needed where the backlit/lightbox sources and reflective overhead light sources match. As you can see maintaining colour consistency in the pre digital days still needed a considerable amount of effort, time and expense. Having said that, when things did go wrong it was not usually as pronounced as colour problems in digital photography. Colour consistency in digital photography starts with accurate viewing conditions. This means having a good quality monitor that is regularly calibrated, as a starting point. “Good quality” in this case, doesn’t necessarily mean a huge, high definition 4K monitor. More important factors are colour accuracy, tonal and colour consistency in different areas of the screen and viewing angle. It is possible to spend a huge amount of money on a monitor and still not get the best colour accuracy. Eizo and NEC make good quality monitors for Photographers, retouchers and graphic designers. Here’s a link to the Eizo range of monitors. I use the Eizo CG246 which is very quick to calibrate via the built in calibration tool and gives me confidence when making colour and tonal corrections. Monitors cost significantly less without built in calibration, but if you go for this option I would recommend buying an external calibration device such as the i1 Profiler. You’ll probably save some money overall, but spend a bit longer calibrating your screen. The accuracy of calibration is very good whichever you go for according to all reports I have read. If you’re not familiar with monitor calibration here’s a rough guide to how it works. The calibration software has a series of colours which it displays on your monitor, one after the other. These colours are measured, either by an external device such as the i1 Profiler, or your monitor’s built in device, which pops up only during calibration. These measurements are compared with the values of the colours stored within the calibration software and a colour profile created which corrects any inconsistencies. If you need to print from digital images you may well need to give printer calibration some thought. Some solutions are beyond the budgets of most individuals. Conversely some printers give decent results out of the box without spending any additional money, providing you use good inks and paper. Most people using prints for personal use don’t feel a need for calibration. If on the other hand you’re a commercial printer churning out tens of thousands of copies, or if exactly the right colours are important, any inaccuracies could be very costly. Calibrating a printer will improve things, but you need to bear in mind that some colours seen on a monitor cannot be reproduced on paper however good your calibration. Remote calibration offers a relatively cheap solution if you have a lower budget. It involves downloading a colour chart, printing and sending it off. Readings are taken to produce a colour profile. This file can then be sent to you to be placed in your colour sync profiles and selected from your print dialog settings. The colour profile will be specific to your printer and paper type. A different profile will be needed for each paper type you use and each printer. Some companies very conveniently offer an onsite calibration service, which is very popular if a little more expensive than remote calibration. For those who need a consistently high level of colour accuracy the solution is to buy a spectrophotometer to create your own profiles. Prices vary from about £300 to £1000. For this you will get the convenience of being able to calibrate whenever you need. There is a huge variation in the price and quality of scanners. At the lowest end you can buy a multifunction printer for under £100. In my experience the scanning function on these tends to produce over saturated colours with detail being lost in the dark areas of an image. They are often more relevant to text and graphics rather than photographic images. At the other end of the scale are the Hasselblad Flextight Scanners (formerly Imacon), which sell for somewhere in the region of £16,000 and are clearly aimed at the professional market. I worked for many years one of these, building a digital archive of a photographer’s huge library of 5×4 transparencies and negatives. I haven’t come across any other scanner I would prefer to use for a job such as this. If you want to reproduce the subtle balance of colours and tones of a photographic image choose your scanner carefully. For personal use I think the scanner function of the Epson xp850 produces good results at reasonable budget. Most scanning software these days lets you alter the colour as you scan in. So is calibration necessary for a scanner? As with printers I think it depends largely on how important accuracy is to you. There is a subtle relationship between colours and tones in a photographic image. An uncalibrated scanner can upset this relationship, which is difficult and sometimes impossible to compensate for with the more general colour and tonal adjustments offered by the scanner’s software or any image manipulation software used post scanning. In addition you may also find you need to make a different adjustment to each image as the range of colours in each image are different. This means a calibrated scanner will also save time. Calibrating a scanner involves scanning in a specific image or colour chart, which is then compared to a digital copy and any differences used to generate a colour profile. Has the digital revolution been good for photography? I have always worked at the post shooting stage and feel that my job is hugely more creative and enjoyable since the digital revolution. So for me the answer to the above question is definitely “yes!”. The ease of being able to make alterations to digital images is a good thing, but does throw up a new set of problems. 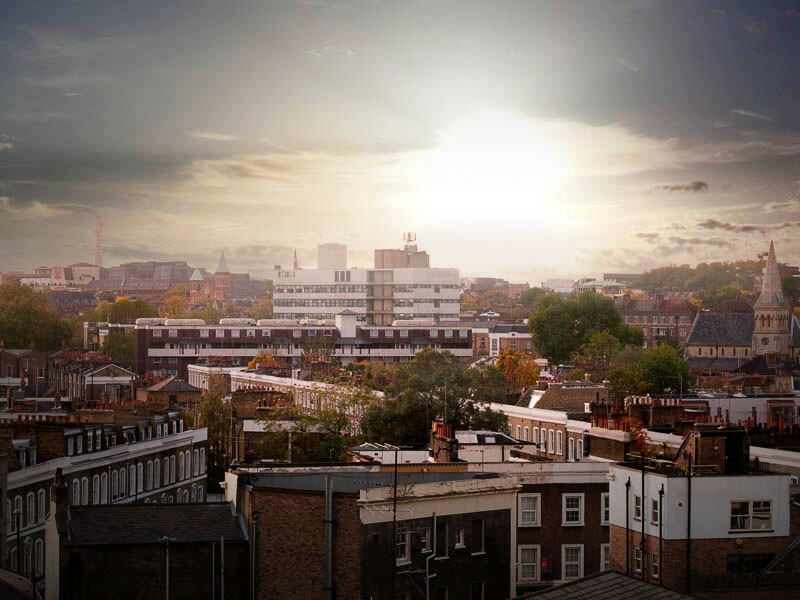 Consider for example, an image that has been carefully colour corrected by the photographer on a calibrated system to match the mood they want and the original colours as they saw them. This same image may be altered by someone else to look good on their uncalibrated monitor and sent off to the printers, giving an unsatisfactory result. It is therefore important for anyone dealing with images in a professional capacity to be reasonably well educated when it comes to colour management. Other consequences of the digital age are an expectation of a higher volume of shots, faster turn around times and in some cases a struggle to maintain standards of quality. These expectations could not be met by a photographer who chose to shoot on film. With the accessibility of digital photography providing cheaper alternatives, I feel that the value of the professional photographer has been devalued somewhat. It may be easier to set up as a photographer these days, but it is more difficult to earn a high wage from it. As traditional methods of photography become a distant memory it will be more difficult to make comparisons such as these. I have witnessed a lot of changes in my career, seeing some photographers thrive and other choose alternative employment. These are my opinions based on my experiences. If you have any comments or differing experiences I would be glad to read them. My last post was on the subject of choosing a suitable photographer for interior and architectural shoots. In this post I would like to discuss what you can do if you have already had shots taken and are not happy with the images you have been supplied with. 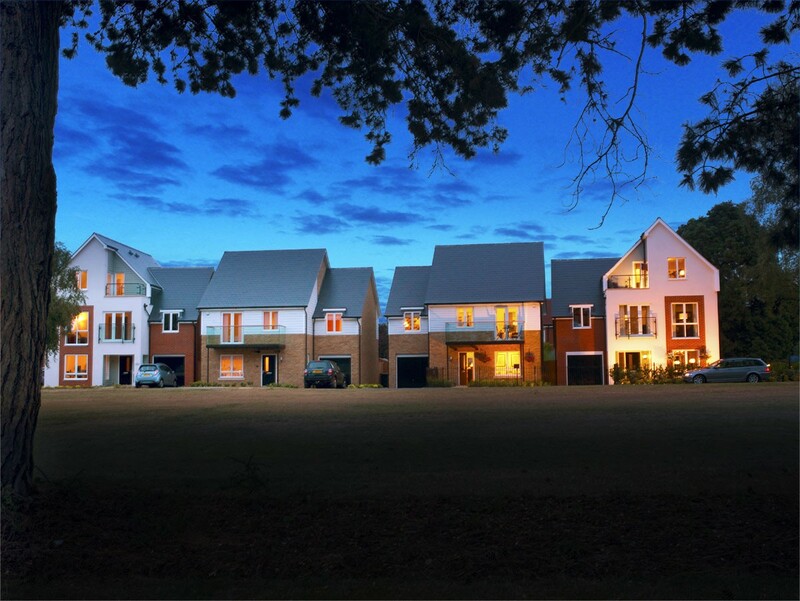 This can sometimes be down to poor photography, but there are more common factors such as poor weather on exterior shots, unfinished building work and landscaping or missing the final few fixtures and fittings on interior shots. 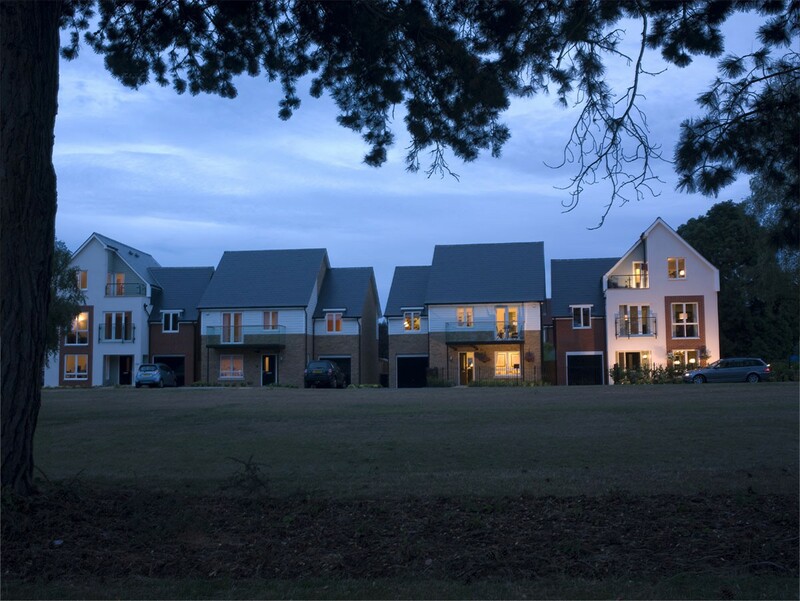 The site manager’s and photographer’s idea of whether a new property is finished are often very different. I have occasionally been on site with a photographer who has travelled a long way for an exterior shoot to find that the front lawn has not been laid or there are piles of sand and heras fencing in front of the property. 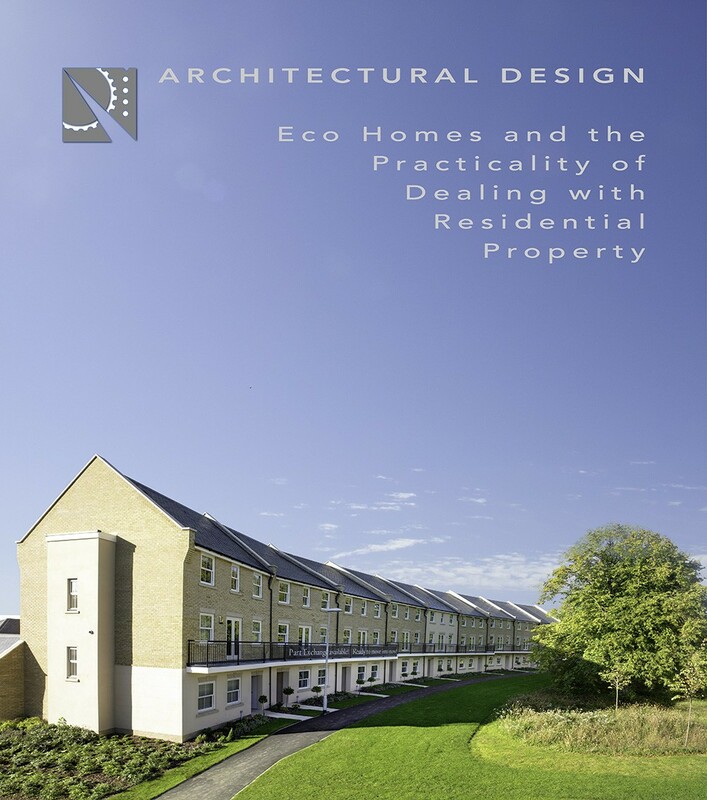 If your shots are not as good as you would like is architectural retouching a viable option? 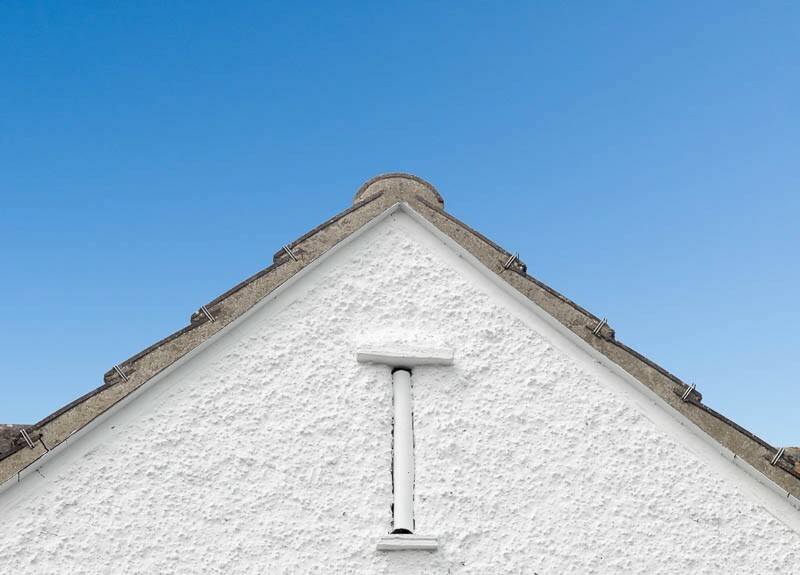 Even if you know a property is unfinished you may need shots for an ad which has been booked in advance and cost a great deal. In cases such as this the photographer may be able to shoot some samples for retouching purposes. If for example a rubbish skip is in front of a building shooting the best angle and then taking a second shot a few yards to one side will give the retoucher the missing bits to add behind the skip. Should you pay for retouching? Retouching can cost a lot, so before spending money you need to know if it will be worthwhile. Putting the skill of the retoucher to one side for the moment, is it possible to get a useable image or is the original too poor quality? Below are a few ideas that might help you make up your mind. Is the resolution good enough? To answer this question you have to know what your image will be used for. If it will only be used on a website or e-mail campaign then the resolution doesn’t need to be that high. If it’s going to print then the resolution needs to be a lot higher but the exact amount will depend on the size of the print. Downsizing a high resolution image will not cause any problems, but upsizing will result in a loss in quality. To give an idea of what size an image will print up to you need to know the pixel dimensions. 300DPI is a good print resolution, but this number on it’s own doesn’t tell you anything and is fairly irrelevant as DPI can be changed without changing the total number of pixels in an image. If you look at the pixel dimensions and see an image has a size of 2400 x 3600 pixels this will print at 8″x12″ if set to 300DPI (2400÷300=8 and 3600÷300=12). If your original image isn’t high enough resolution for your needs then paying for retouching is not worth it. If your image is not correctly exposed, or there are either shadow or highlight areas that have no detail in them it may be possible for them to be recovered. This is a lot more achievable if the RAW files are available. Photographers very rarely supply RAW files because they are so flexible and may well result in their photography looking very different from how they intended. As the photographer was there at the time of shooting they have a good idea of how the images should look and so normally process their own RAW files. It may however, be worth politely asking for the RAW files to be made available to a retoucher if the final result is run past the photographer or if the photographer deals directly with the retoucher. Is it worth adding a blue sky? This is something I have seen done badly many times. Does your external shot have shadows with clearly defined edges?  If not a clear blue sky will not look right, but you may be able to add a sky with lots of clouds and some blue areas. If the shadows are clearly defined then the image will take a sky well. There is a special case for skies added to north facing buildings. The front of a north facing building will be in shadow at any time of day, assuming the building is in the northern hemisphere. The original sky will probably be bleached white. If it’s a sunny day the building will be in heavy shadow, so a less sunny day for shooting may be preferable in this case. It is possible to add a believable sky, but it will need to appear overexposed. I have a collection of sky samples which I have deliberately shot facing roughly toward the sun, but still containing some blue for use in this type of image. Is it worth adding a night sky? Adding a sky to a night or evening shot is usually achievable, but the sky and main shot need to match and can look very bad if done poorly. There are many rules for what makes a good match, sometimes with a certain amount of trial and error by the retoucher. The light values and colour of the main shot may need to be changed so it fits with the added sky. The sky doesn’t fit for many reasons. Most importantly it is a very warm sky and the colours from a warm sky tend to effect the colours in the main image. 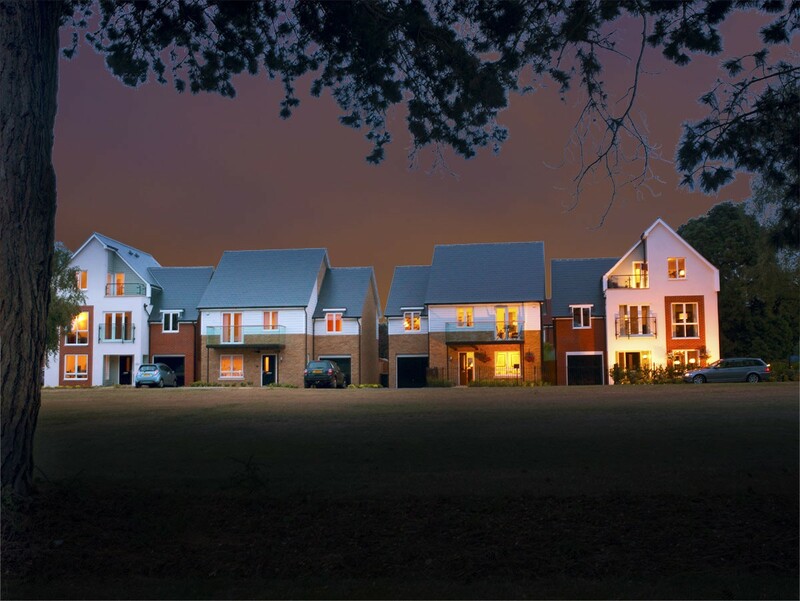 If you want an architectural retoucher to do a good job of adding a night sky you have to let them have a certain amount of artistic license. colours and light values may vary hugely from the colours in the original as they are effected by the added sky, but done properly the results can be stunning! What other ways can a retoucher improve an image? You will notice the walls on the far left and right both lean in towards the middle of the image. All upright lines are now parallel to each other and are true verticals. The effect of barrel distortion can be seen more easily near the edges of the image. The vertical lines curve out towards the sides. The landscape version has already had the sky added. For a retoucher to then change the sky to make an upright version is a very quick and therefore cheap job. If your not happy with colour, contrast or brightness of an image make sure you are looking at it on a regularly calibrated, high quality monitor designed for photo editing work. Eizo and NEC are both good makes, but you can expect to spend £1,000 or more. If this is beyond your budget then you may be better off trusting your photographer or retoucher who should be working on a calibrated monitor. You may want a retoucher to remove any objects that are ugly, detract from the focus of the image and are not permanent fixtures. This can be anything from dirt on the road, to bins, signs, plot boards, fencing or railings. 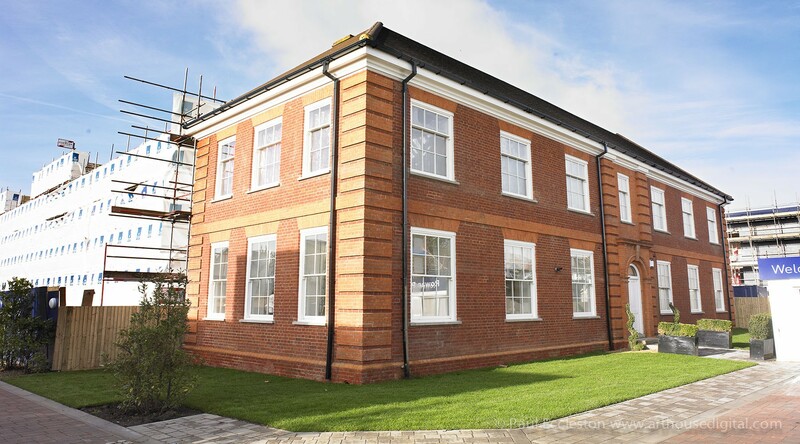 If you are using the image to sell a specific property rather than a house type you may need to be careful you don’t remove permanent objects such as that ugly factory next to the property, as this may be seen as dishonest. I hope you find this useful in deciding wether to have an image retouched and what you may ask to be done by a retoucher. Most of my work can be carried out remotely. If you e-mail me a low res file I will be happy to give you a no obligation quote. Choosing the right Interior and Architectural Photographer. 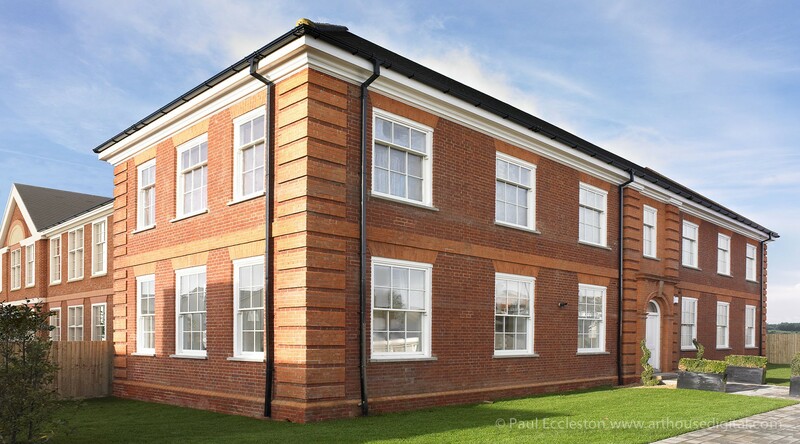 There is a huge variation in both price and quality when looking for an architectural photographer. I will try to clarify what you might expect from different types of photographer and the results achieved at various budget levels. I have mentioned some prices here which relate to my own personal experience. My perspective here is not from that of the photographer, property developer or architect although I have spent most of my working life dealing with all three. My view is that of a retoucher who sometimes has to alter a shot to please both the photographer and their client. Ideally you want fantastic images each time, but this is not always possible within smaller budgets. So…. Put simply, you more or less get what you pay for. Of course there is considerable variation in pricing, with a fair amount of competitiveness. I would like to suggest five categories of photography. Choose a category that suits your budget, but don’t expect a photographer from one category to compete in price with a photographer from another category. Lets start from the ground up with the cheapest option. Option 1: Send out the member of staff who has the most free time. For those who have little or no budget this is still a huge improvement on having no images. The best you can expect are images that will show the areas of a building you would like clients to see, but probably not with the best composition and exposure. The images will probably need some explanation such as “it looks even better in real life” or “there’s a really nice view out the window which you can’t see in the photo”. The images will probably be a good enough resolution for web and small print use. Why budget £5? Well you don’t want seem tight fisted! I’m sure you can afford a cup of tea and a sandwich for the member of staff you’ve just put outside of their comfort zone! Option 2: The keen amateur. Price range, same as above for the same reasons. You may be, or know someone, who is a keen amateur photographer. 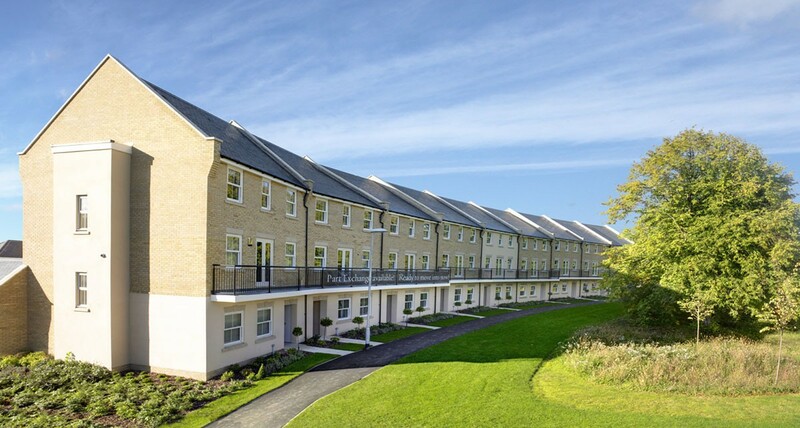 I have seen property developers use amateur photographers who are doing them a favour. So what do you get if you use an amateur photographer? You will probably get nicely composed images, with good exposures. They will show the property clearly (if you’re lucky) so people will have a good idea of what it looks like. Maybe a better question is what don’t you get? An amateur is unlikely to have invested as much money in equipment. If they have spent a lot they are more likely to have an expensive camera better suited to portraits or PR shots. It is unlikely they will have any lights, having to make the best of natural light or flash. Also an amateur is used to looking for good subjects to shoot, whereas a professional doesn’t have this choice. They have to stick to a brief and make a good shot of what’s required. An amateur may be happy to shoot for small amounts of money, just being happy that their images are being used for ads. I think this novelty would soon wear thin if they are expected to shoot regularly. Option 3; Using a Non-Specialist Photographer. Price Range can vary hugely depending on circumstances. I would suggest anything from £100-£300 per day. You may end up using a photographer who doesn’t specialise in architectural and interior photography for several reasons. I’ve seen this happen when a PR shoot takes place. While the photographer’s there, they are asked to quickly take some additional shots of building exteriors. Another reason may be financial. You could get some decent shots at a good price, but there are a few setbacks. Firstly if the photographer hasn’t been able to plan the shoot weather conditions may not be favourable or the angle of the sun may not be at its optimum. Secondly he probably won’t have the precise equipment needed. A good quality DSLR camera is fast to use and a great choice for a PR shoot. If used for an architectural shoot the resolution will probably be adequate, but there will be more lens distortion than you get from a medium or large format back. Even taking into consideration lens correction, which can be carried out post shooting, medium format will have a more natural feel. A plus point, if you like a lot of choice you may get a larger volume of shots, but with less time taken to perfect each shot. Option 4: A Specialist Interior or Achitectural Photographer. Costs are likely to be a minimum of £400 for a full day up to about £750. Someone who specialises in architectural and interior shoots is likely to be using a medium or large format back. The cost of buying and maintaining this is considerable and you can therefore expect this cost to be reflected in their rates. A photographer who does not take these costs into consideration will probably come to a point in their career when they will be unable to keep working with the same quality of equipment as they won’t be able to afford repairs or replacement costs. A tilt shift lens is also a specialist requirement, which may not be found in any other photographers collection of lenses. This will allow the photographer to avoid converging verticals when taking exterior shots. Lighting for interior shots can make a huge difference. 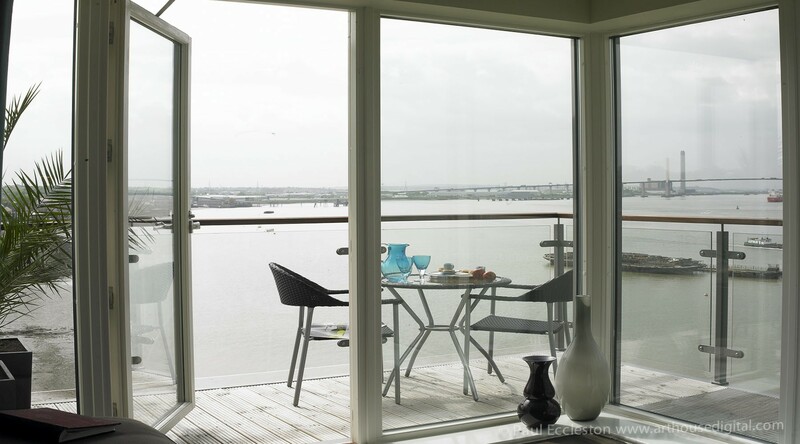 If you would like a window view to be prominent for example, then flooding the interior with light will minimise the difference between interior and exterior light values and preventing the view from being overexposed. Propping shots is a fairly standard idea that most interior photographers are prepared to do, but maybe at a small additional cost. This would include items in an interior shoot such as towels in the bathroom, books on a bedside table, food in the kitchen or ornaments. Communicating a feel or colour scheme to the photographer will help them in the choice of props they bring along. In general the idea is to give a show-house a more lived in feel. 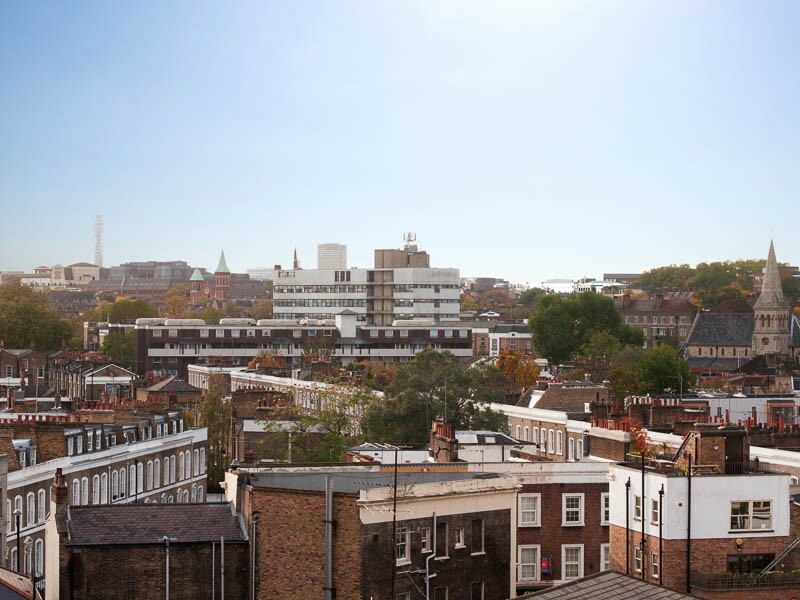 An architectural photographer who is used to working on half finished sites may well have their own high vis jacket, hard hat and if in the UK a CSCS card allowing them to be on a building site legally. Option 5: Specialist Photographer without time or budget restrictions. If there’s no time limit this is the ideal solution, but more time will also mean more money. So if there’s not an imminent deadline for that important ad you may want to consider this as an option. 1. Visit the site before the main shoot. This will allow them to get an idea of what’s needed. Some test shots can be taken just to get an idea of different angles and views to run past you the client. The shots will tend to be quick snaps without the worry of catching good weather and adding final touches. I think this really is the best means of communicating visual ideas and seeing what works best. 2. Pick a day where the weather is at its best. This may involve a couple of visits, especially with the unpredictable weather in the UK. 3. Removing objects from an exterior shoot. If the best day for weather happens to be bin day then the photographer may have the time consuming job of moving a lot of bins out of shot. Another time consuming task is getting that ugly white van moved from in front of the key property. This usually involves knocking on doors to find the owner who is often grumpy and refuses to be of any help. 4. Grabbing the postman or any other random member of public who may be passing by. Having people in the image adds a different feel to a shot. A photographer should have a stack of model release forms for any unsuspecting member of the public to sign allowing the images to be legally used. 5. Spend ages getting those creases out of the sheets on the bedroom shots, lighting candles, LED displays on, a film showing on the home cinema screen or any number of additional final touches. The fussiest photographer I worked for would also dampen down tarmac to give it a darker look and make sure the pile on a carpet all lay the same way to give an even tone. This may seem a bit over the top, but the images looked fantastic and I loved being part of the process of making such great shots. This seems a relevant time to mention hire of models as this also falls into the category of bringing a shot to life. The cost of models can be as expensive as the cost of a photographer. If you are offered a cheap rate make sure you know what you are getting. Quite often model rates are governed by the license type. A cheap license will restrict your use, not allowing you to use the images for more than a year or outside the country for example. If you inadvertently buy the wrong license you can change it retrospectively, but may end up paying above the original cost. Free or very cheap images are hugely better than not having any images at all. I would not suggest you completely rule out this option. At the cheaper end of keen amateur/less expensive professional you may get some images which will make your property look beautiful. 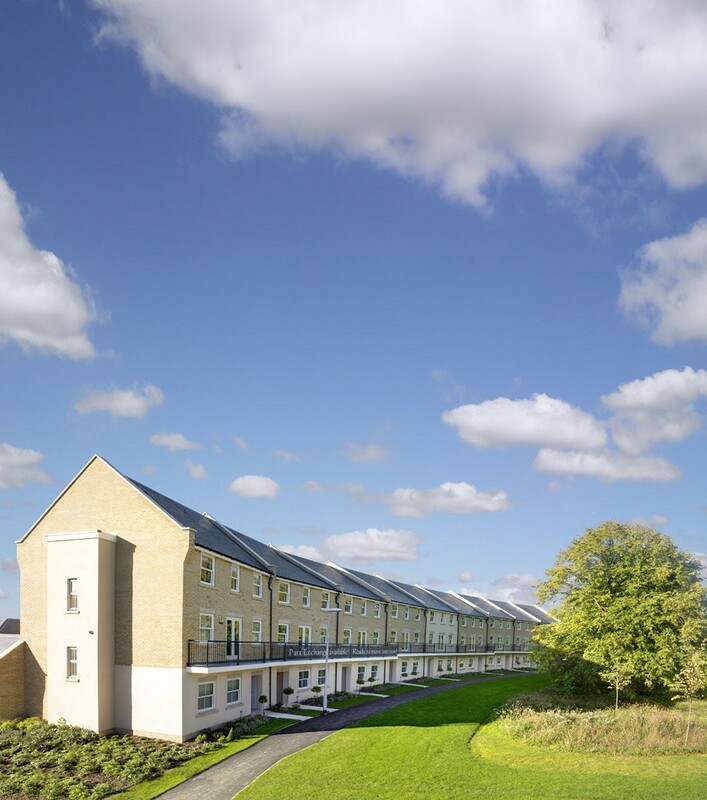 A good professional architectural or interior photographer will be able to convey the idea that you will have a fantastic lifestyle if you live in this property. This is a very powerful message and will make the property more desirable. To illustrate this, imagine a shot of a patio outside a brand new house with garden furniture laid out on it. This may be a great image and would help in selling the property. Now put a glass of wine and an open book on the table and the idea that you can relax in the garden is conveyed. Then put a parent and children playing in the garden and you can imagine how happy your family could be living there. Another key point here is that a photographer who turns up with a DSLR camera and flash can take a large volume of shots onsite at a cheap rate. A Photographer who turns up with a car load of lights, laptop and props will charge more and give you fewer shots of a higher quality. Knowing which you are paying for will help you to decide if you are being charged a fair rate. I hope this gives an awareness of why daily photography rates can justifiably vary so much and what you can expect for you money. In my next blog I will discuss what can be done if you have images you’re not happy with and seeing if there is potential for improvement post shooting. 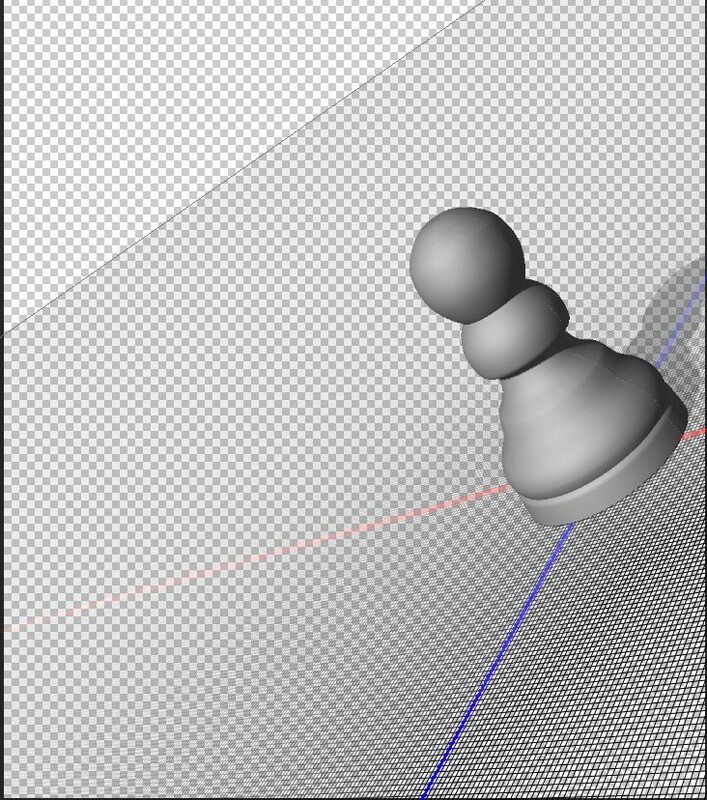 This post follows on from Photoshop 3D beginners tutorial (Part one) and Photoshop 3D beginners tutorial (Part two) . We will start with the object created previously and I will be assuming that you are familiar with Photoshop outside of the 3D environment. The object is resting on the ground plane at the intersection of x and z axes. 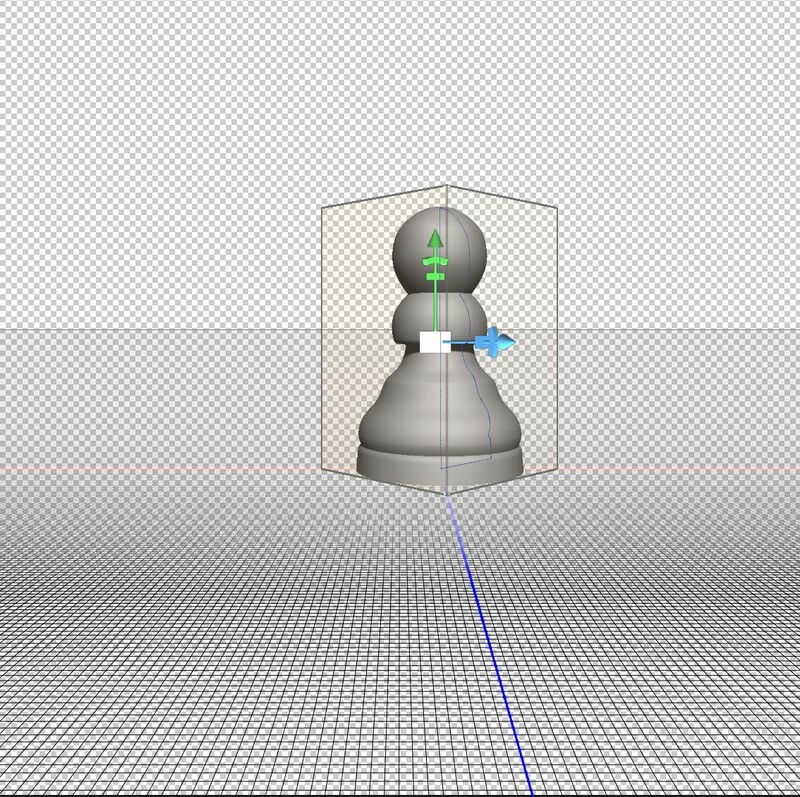 If your object does not look like this you can reset it via the co-ordinates pallet as described in the previous blog. Firstly let’s look at moving around within the 3D environment. This is very different from moving the object, which is what you were doing in the last post. 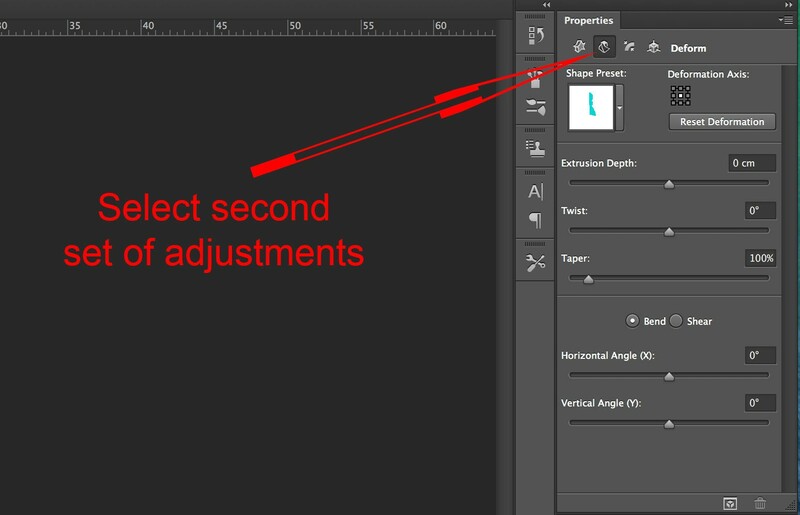 You will be using the same move tools found at the top of the page when in Photoshop’s 3D mode. They will only be visible when the move tool is selected in the tools pallet on the left hand side of the screen. You will also notice that the object stays on the ground plane at the intersection of the x and z axes and that the shadow always falls on the same area of the ground plane. You will just be changing the viewing position. The light source object and ground plane remain fixed in relation to each other. The far right hand move option now appears as a camera icon. We will come back to this later. 1.You will notice that the horizon line stays at the same angle, which is set as horizontal in this case. 2.You cannot go closer or further away from the object. 3.You are always looking directly at the object. Effect of Roll Camera Option. Imagine you are moving the camera on a plane parallel to your monitor when using this option. This is the plane defined by the x and y axes. You can therefore move up, down, left and right. Imagine you are moving the camera on a plane perpendicular to the monitor, or parallel to the ground plane. This is the plane defined by the x and z axes. You can therefore move left, right, closer and further away. You may find this tool particularly useful when needing to look at close up details or zooming out to view the whole scene. This is the option on the far right and has a different icon to when moving a selected object. This is fairly self explanatory as it has the effect of zooming in on an object. It is similar to the slide option, but does not allow left and right movement. 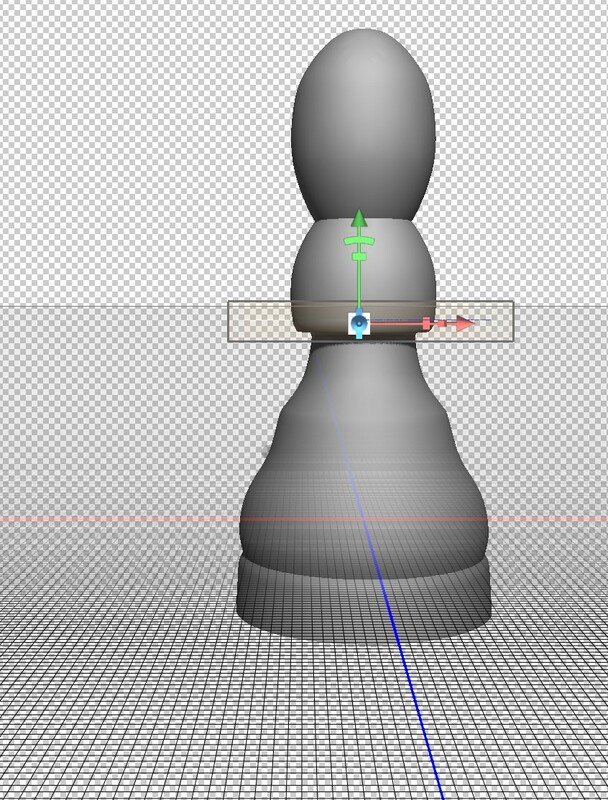 The three blogs so far should have given you a good understanding of how to create a 3D object with rotational symmetry, how to move that object around and how to view it from any angle. To Start, increase your canvas size to allow extra space to the right where you are going to put the duplicate objects and change your viewing angle to something more pleasing if you wish. Increasing canvas size is done in the same way as when working in normal two dimensional mode. What you have here is not only four identical objects, but also four identical backgrounds and four identical light sources. Each layer acts independently, which means the objects will only cast shadows on the background and not on each other. Also the objects take up the same space so they will appear as one object at the moment. What you want is four objects moved to different locations on one background with one light source. Logically you would think that you could position the four objects where you want them to be, merge the layers and the job would be done. 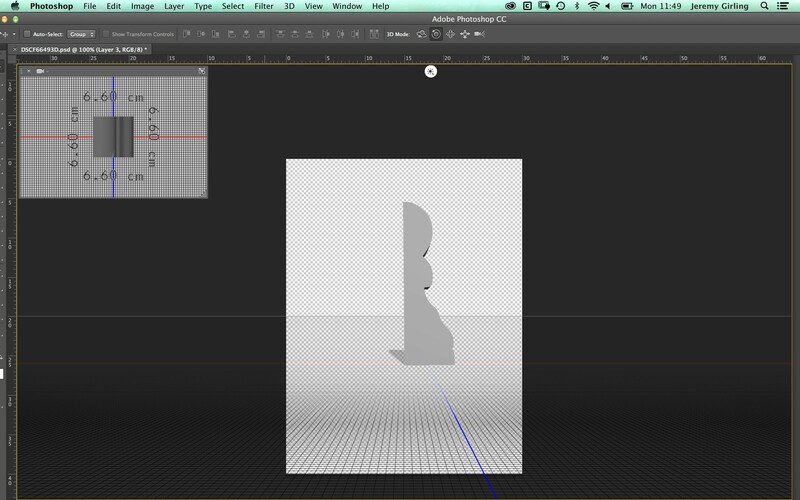 that’s how you would work with two dimensional objects normally in Photoshop. There are several problems with this when working in 3D: Firstly your layers may have different light sources and the ground plane may be viewed from different angles meaning Photoshop has to choose which ground plane and which light source to choose; secondly, as in this case, even when the backgrounds and light sources match exactly Photoshop doesn’t place the objects accurately; lastly you will lose a lot of 3D data if you merge layers via the standard Layer>Merge Layers command. 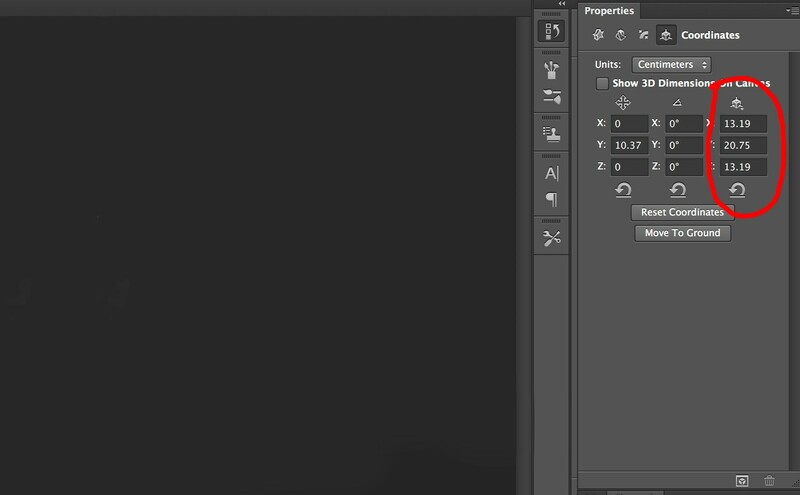 I’m working in Photoshop cc 2014 here, but pre cc versions of Photoshop only allow you to merge two layers at a time. 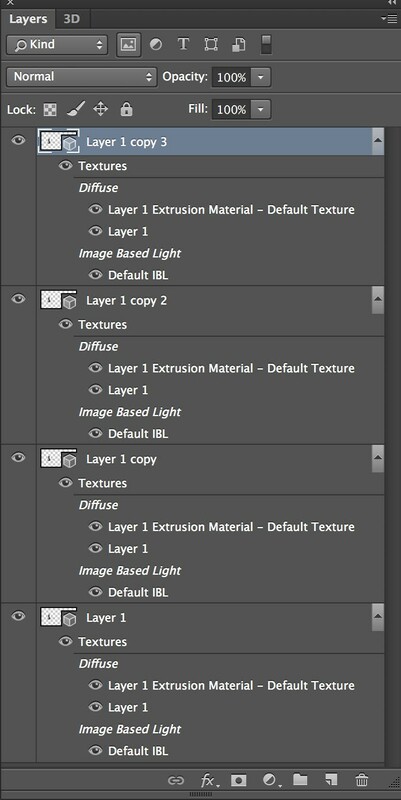 This means you will need to work in stages until you have just one layer in the layers pallet. You now have four objects that appear to be one, as they are directly on top of each other. There is only one ground plane and one light source. Now look at the 3D Pallet. The four objects can be seen and manipulated here. The four objects are labelled Layer 1, Layer 1_0, Layer 1_0_0 and Layer 1_0_0_0. A closer look at the co-ordinates area of the properties pallet may show that all four objects are not aligned on the ground plane and at the intersection of the x and z axes. 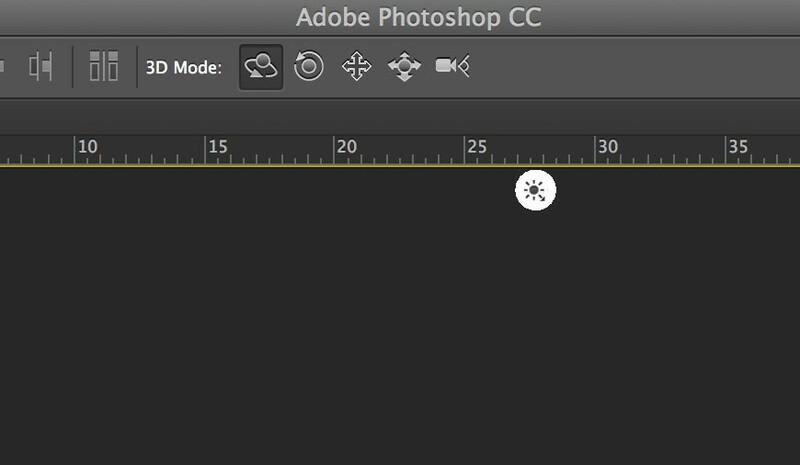 I’m not sure why this should be, but Photoshop seems to shift things around in the merging of layers. I like to reset all the co-ordinates and move the objects onto the ground plane to start with. I want to leave the original, which is labelled “Layer 1”, in it’s original position. The image of the 3D pallet above shows Layer 1_0 selected. This object can now be moved using one of the methods described in the previous blog. If you want even spacing between objects, typing in coordinates may be the easiest method. 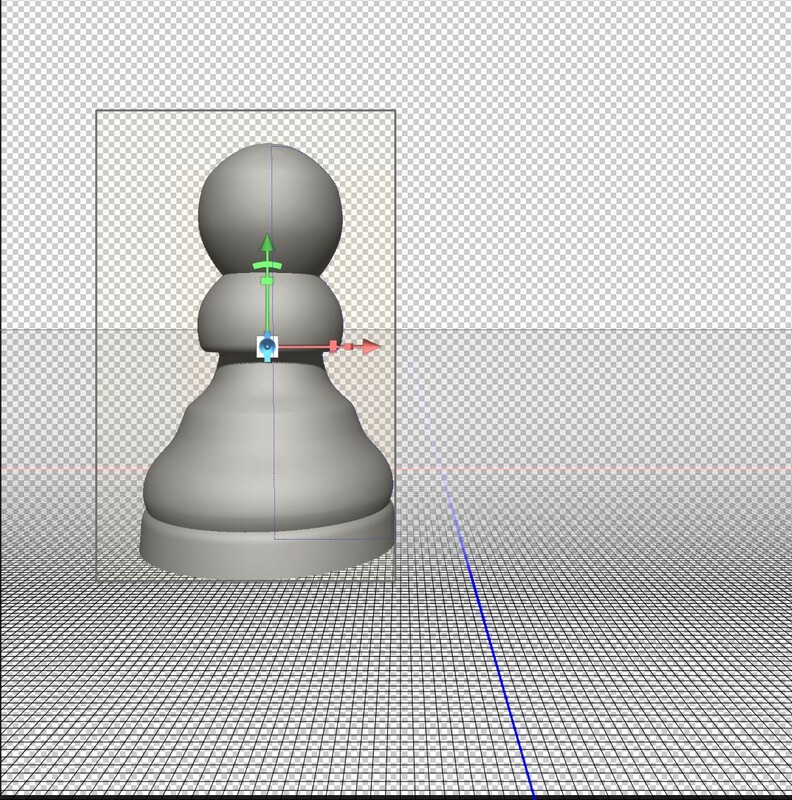 I used the move tool options to lay a pawn on it’s side. Also useful was the “Move to Ground” option in the co-ordinates tab on the properties pallet and the use of the secondary view window. If the secondary view window isn’t visible you can open it by going to View>Show>3D Secondary View. You should now have the knowledge to create a scene with several objects. 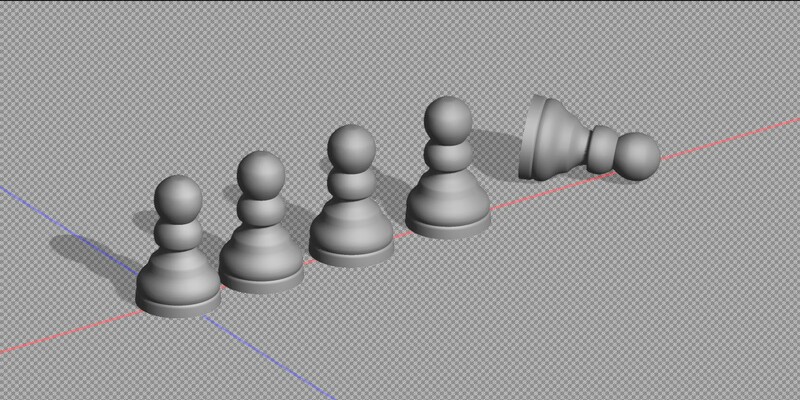 My example uses duplicate objects, but you can make several different objects using the methods described to make up a scene of your own. In this second part of my Photoshop 3D beginners tutorial I will assume you have created the object in Part 1 and that you are reasonably proficient in other functions of Photoshop outside the 3D working space. 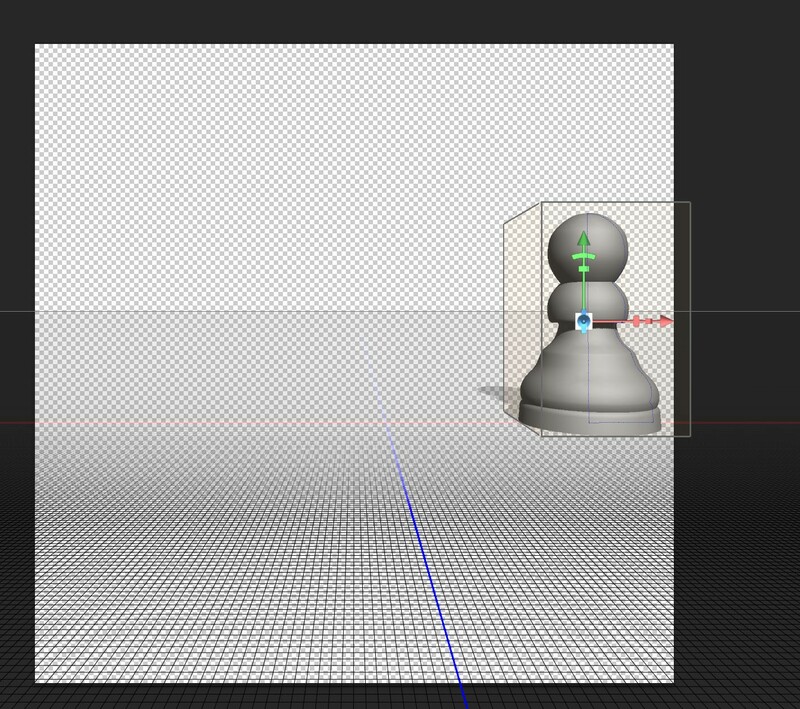 Moving objects within the 3D workspace. 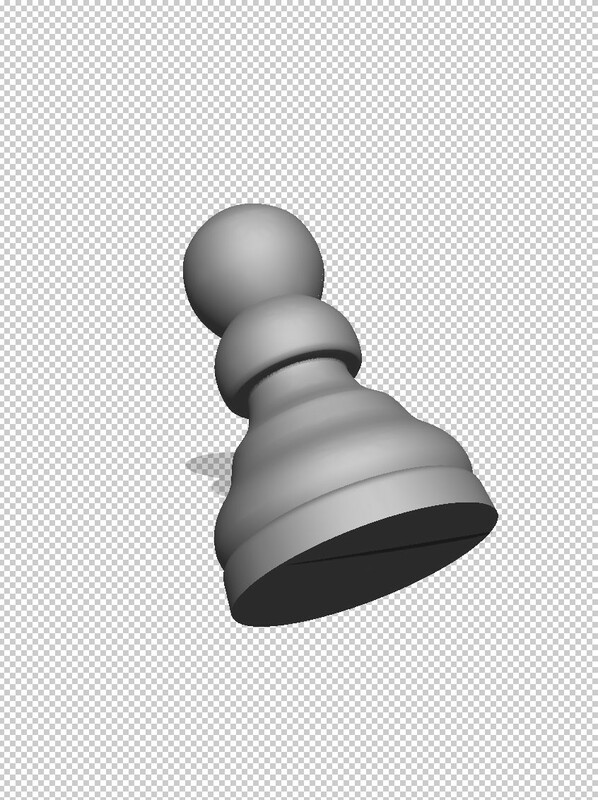 Here’s the object created in the last tutorial. If you prefer, you can use any other object you have created. The principles in this tutorial will be the same. The “x” axis is marked in red on the ground plane, going from left to right. You will also notice a red arrow with a couple of other symbols on it within the box showing the image is selected. 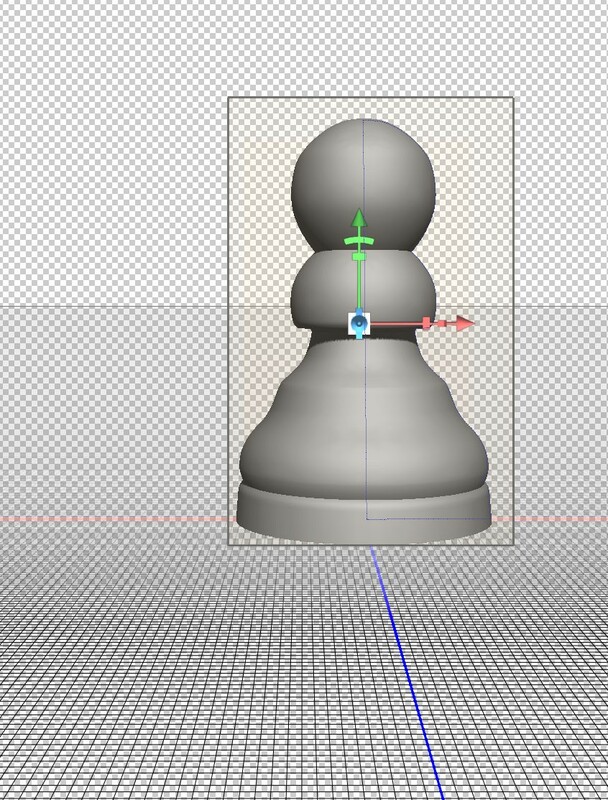 This is for controlling movement in relation to the “x” axis, and we will take a closer look at this later. The “y” axis is not marked on the background, but is the up/down axis marked by a green arroow on the 3D object. 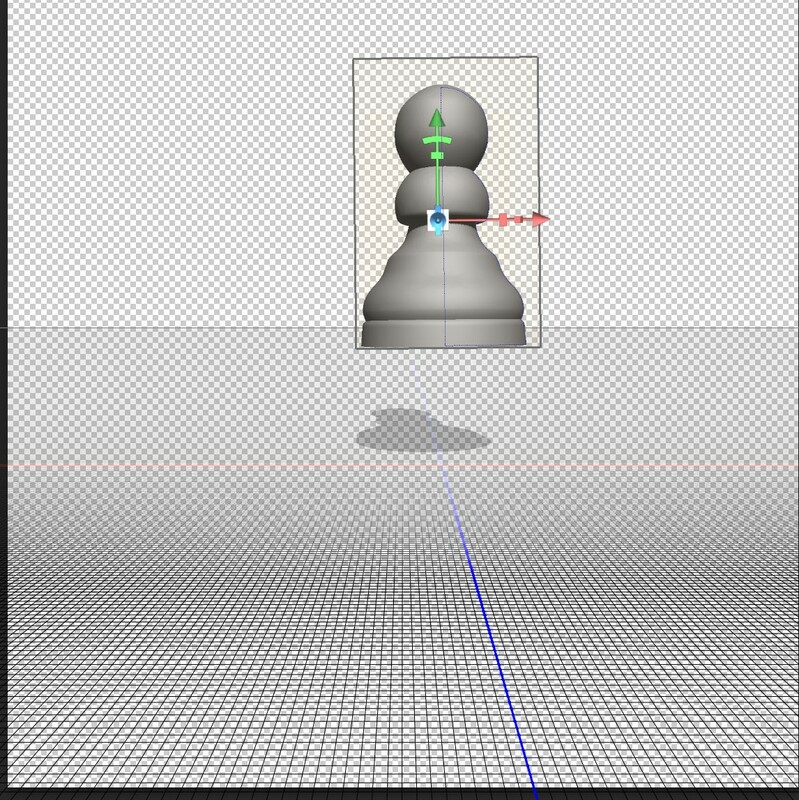 Lastly the “z” axis is marked in blue on the background layer and is used to move the object closer or further away. Again there is a blue arrow on the object when it is selected. It is pointing straight forward and is therefore not easy to see in the example above. Moving and scaling 3D objects using the Properties Pallet. Looking at the coordinates on the far right you will see 13.19cm for both the x and z axes. This shows that the object has rotational symmetry. If you changed one of these you would have more of an oval shape, which is not what’s needed here but may be relevant for different objects. The reading of 20.75cm for the y axis shows the height of the object. These are just the dimensions of the object and do not change if the object is moved about within the 3D space. The central point of the object has not changed. This means that it still lies on the intersection of the red “x” axis and blue “z” axis. Because it has increased in height from a central point the lower part now goes below the ground plane. Step back in the history pallet so you have the original dimensions (x at 3.19, y at 20.19 and z at 3.19). x has a reading of 0cm. This shows that the central point of the object is on the red line. z has a reading of 0cm showing the object is also on the blue line. As x and z both have a reading of 0cm the object is on the intersection of the 2 lines. Now for the y axis. This shows a reading of 10.37cm. This may seem strange at first. The y axis is the up/down positioning of the object. If you reset the coordinates this reading becomes 0cm. You then see half the object above the ground plane and half below. 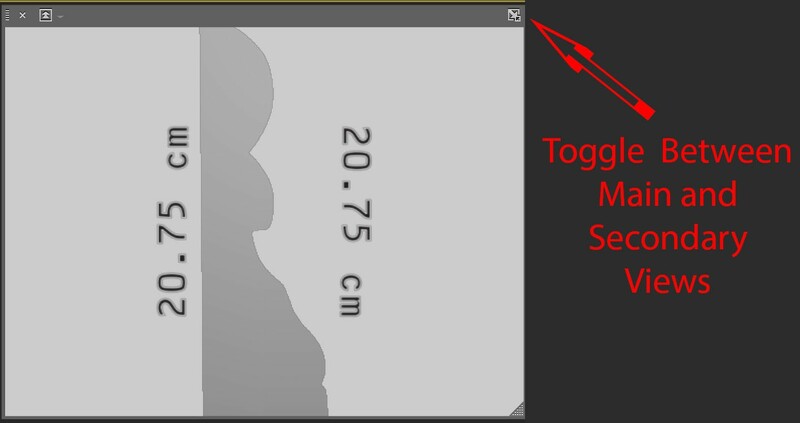 If you then click on the “Move to Ground” button the y axis reading will show half the height of the object. I have made some changes to the positioning of the object in the next few examples which involves altering figures in the first column. Have a look at the captions under each image to see what alteration has been done to each. 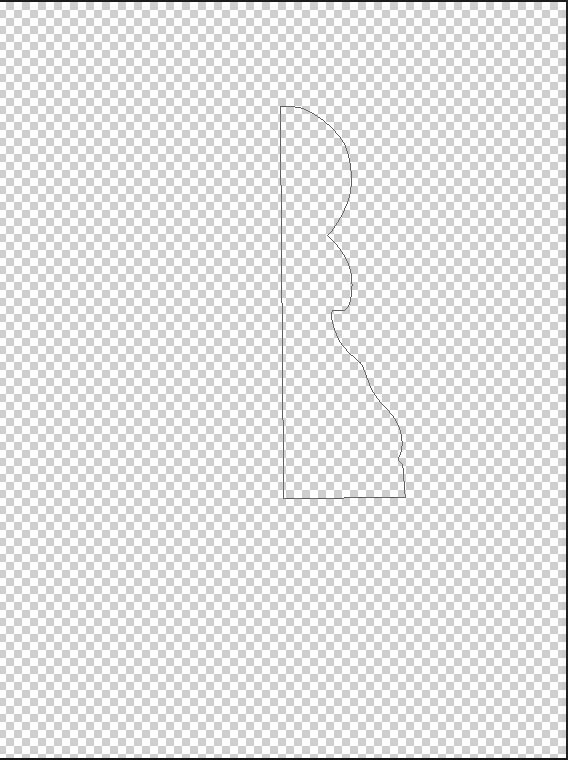 I have also increased the canvas size, which you do exactly the same way you would when working on a two dimensional image. The object has been moved along the red “x” axis. It has moved to the right because a positive value has been entered. A minus value would have moved it to the left of the blue “z” axis. 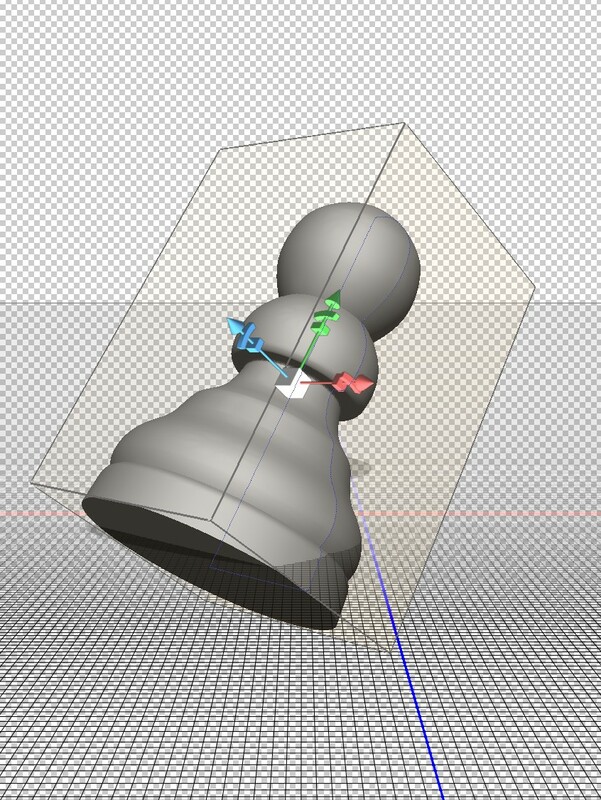 A positive value in the “y” coordinate setting will float the 3D object above the ground plane. It is also possible to enter a negative value to put the object below the ground plane. 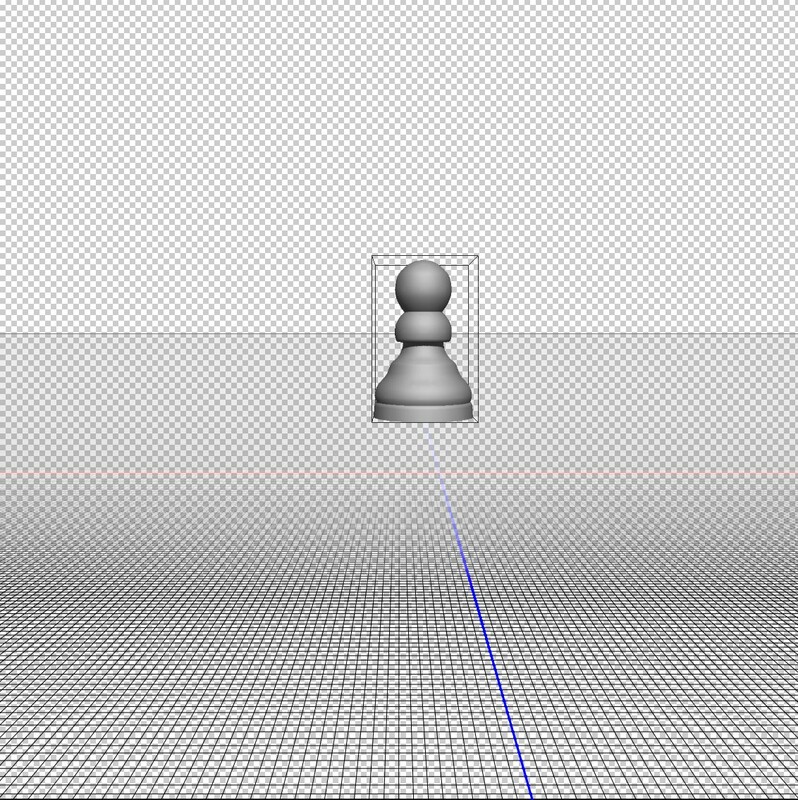 I have entered a negative value on the z axis, moving the object away from the viewer along the blue line. A positive value would have moved the object to a position in front of the red “y” axis. 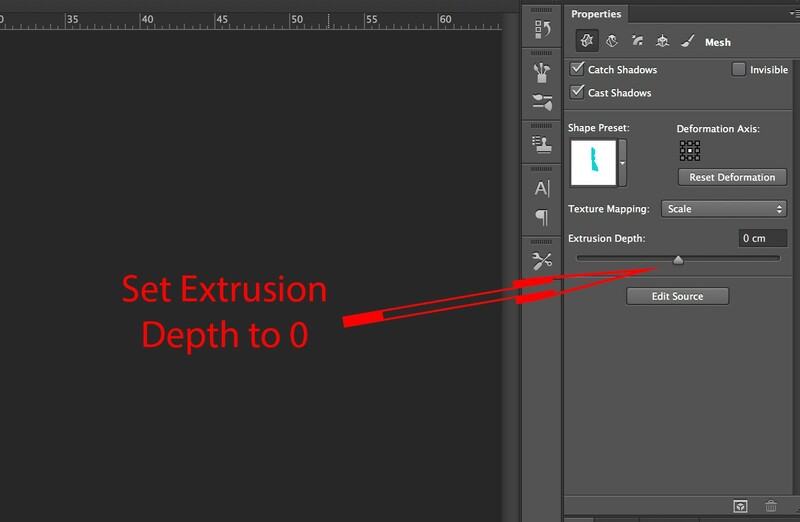 A minus setting on the “x” axis means the 3D object has moved to the left. A positive setting on the “z” means it has also moved forward to a position in front of the red “x” axis. 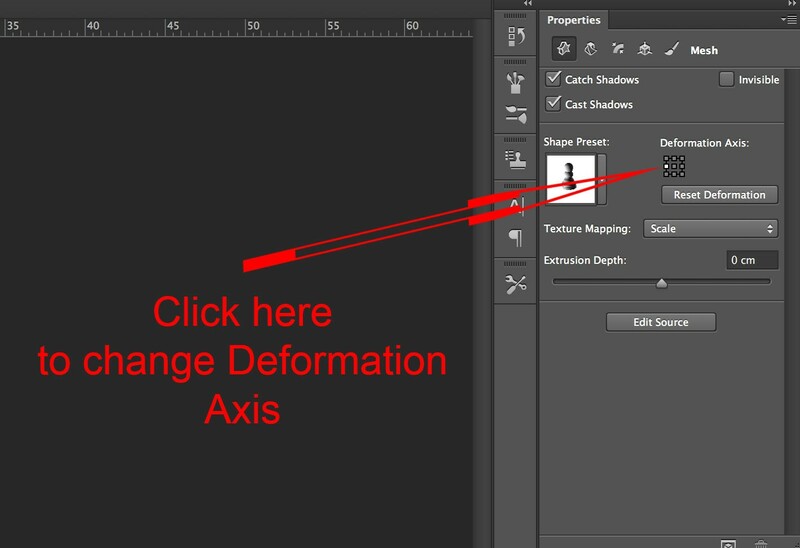 Here are three images to show how rotation about each axis looks. The caption under each image gives the settings. 45 rotation on y axis. Rotation about the “y” axis makes no difference to the object, as it has rotational symmetry about this axis. You will notice that the box around the 3D object now appears with it’s corner pointing towards us. Notice that rotation “x” and “z” axes will result in the object no longer being on the ground plane as rotation is always about the central point. Entering numbers in the Properties pallet is useful for accurately positioning 3D objects. However there are quicker more intuitive ways of working. 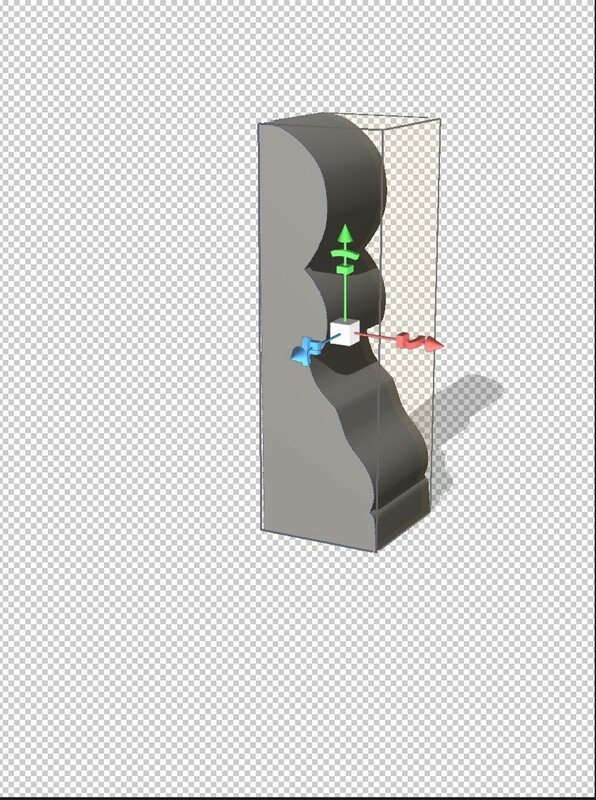 The image below shows the object viewed from a different angle so you can see the red green and blue arrows that appear when a 3D object is selected. The red arrow corresponds to the “x” axis marked in red on the ground plane, the “y” axis corresponds to the green arrow, and the “z” axis corresponds to the blue arrow. You will notice that if you hover over the tip of each arrow it will be highlighted as shown below. You can then click and drag along the relevant axis. When the above arrow is highlighted you can move the object from left to right. Notice the tip of the arrow is highlighted in yellow. Now Move the cursor slightly to the left. The rotational symbol will now be highlighted as shown. Notice how the above image shows the red “x” rotational symbol highlighted, however the text reads “Rotate Around Y Axis”. If you think about it, it would be difficult to rotate on the “x” axis by using the red handle. The rotation needs to be at right angles to the axis for ease of use. 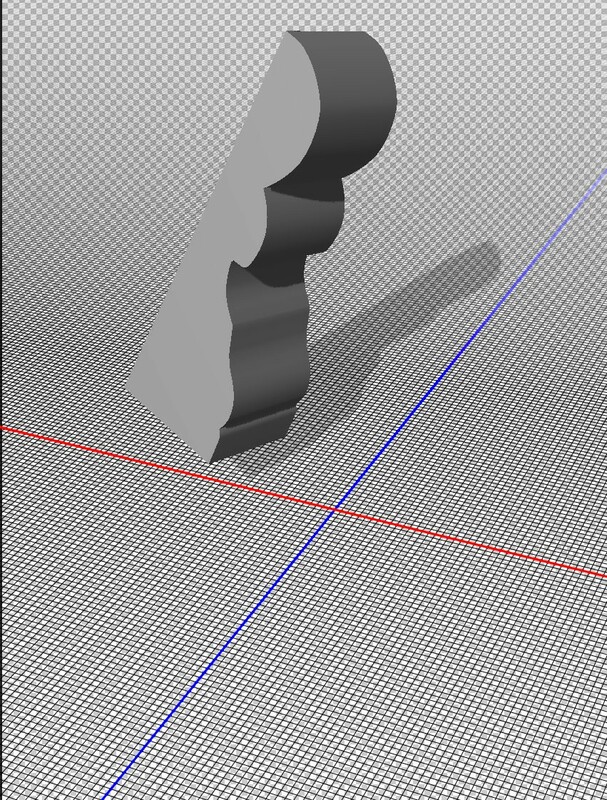 Moving the Cursor in a bit further to highlight the box will allow you to change the dimensions along the “x” axis. Once you have got the feel of making movement, rotational and scale alterations using this method on all three axes there is just one more alteration to look at. That is the white box in the middle. This is a click and drag alteration, same as the others. The difference is that it increases or decreases the size of the object while maintaining the correct proportions between x, y and z axes. This method may well be your preferred method for quickly moving an object around. The small controllers on the axes are sometimes difficult to pinpoint, especially if you are using a pen and tablet. As the message that appears indicates, you can click and drag to move the object left to right on the x axis. Now move your cursor closer to the edge of the box. Again you get a message indicating the direction of movement and the three visible edges are highlighted in yellow. Now position your cursor directly onto the edge rather than just close as in the last example. 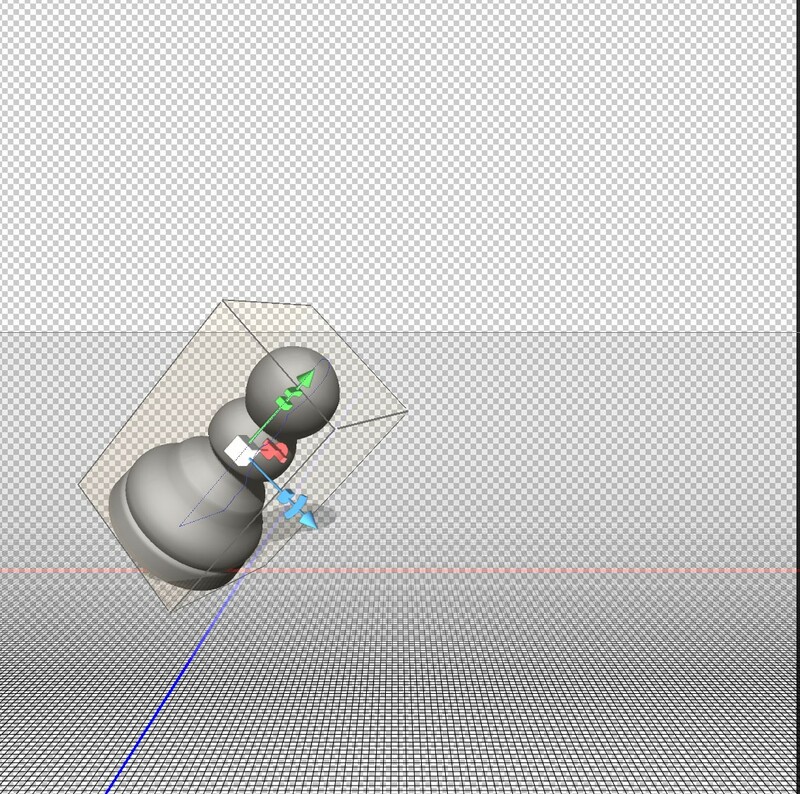 This will allow you to move the object on two axes simultaneously. Move on X and Z Plane simultaneously. The above example is very useful as it is possible to move an object around on the ground plane without accidentally moving it up or down. Moving using the sides and edges of a box may at first seem like a much better solution than using the control axis. There are however situations where the side of the box is at right angles to the viewing position and not accessible. In this instance using the control axis would be a better solution. 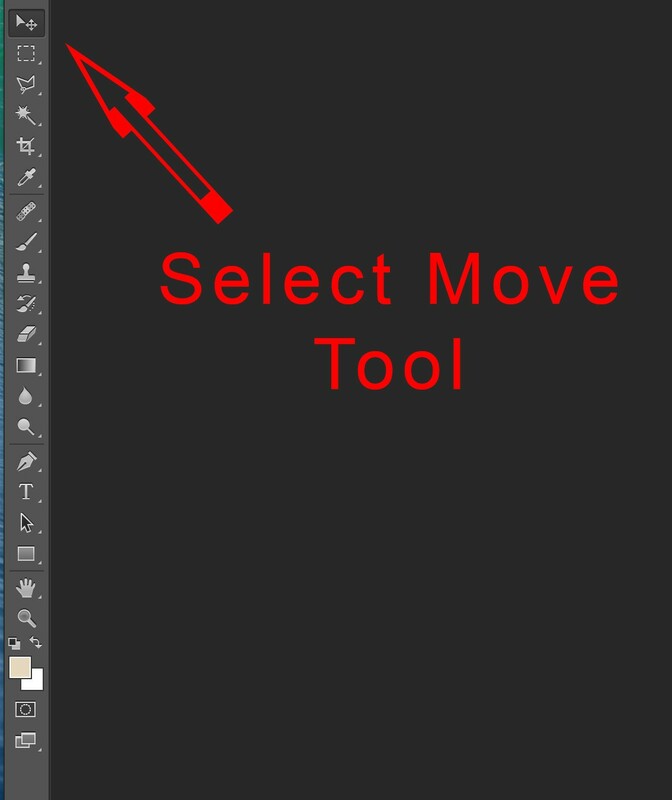 3D move tools, Rotate tool selected. 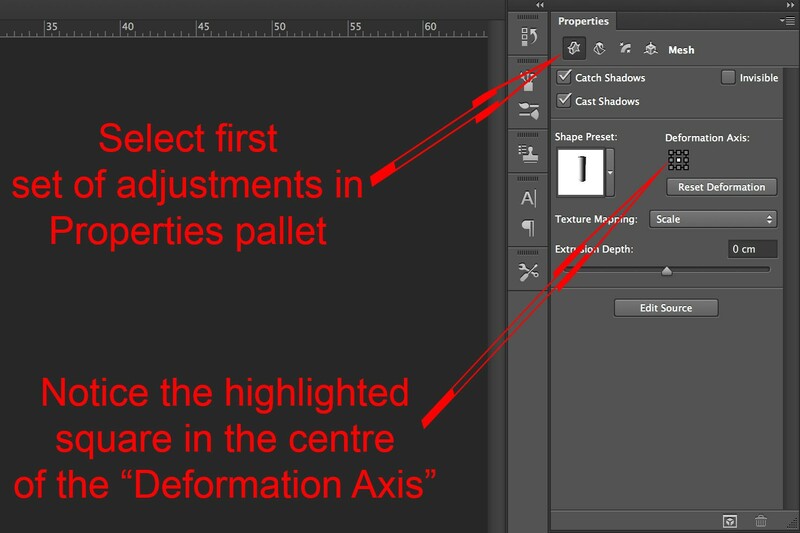 When using any of these tools make sure you don’t accidentally click on the control points of the box that indicates the object is selected as this will confuse things. 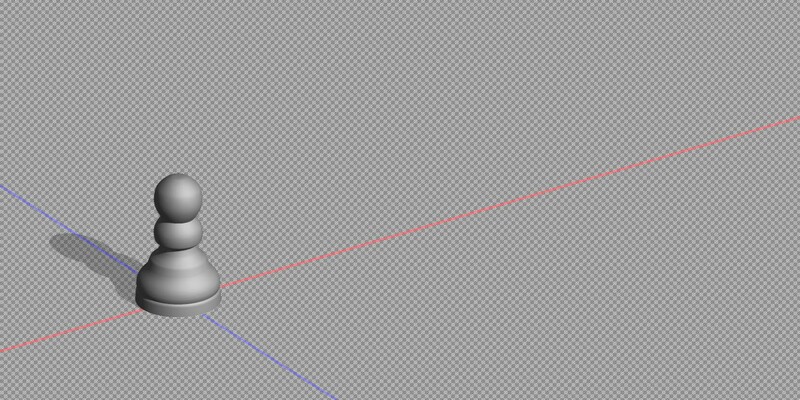 Clicking and dragging anywhere outside the objects box will allow you to do this, but make sure you don’t accidentally deselect the object. 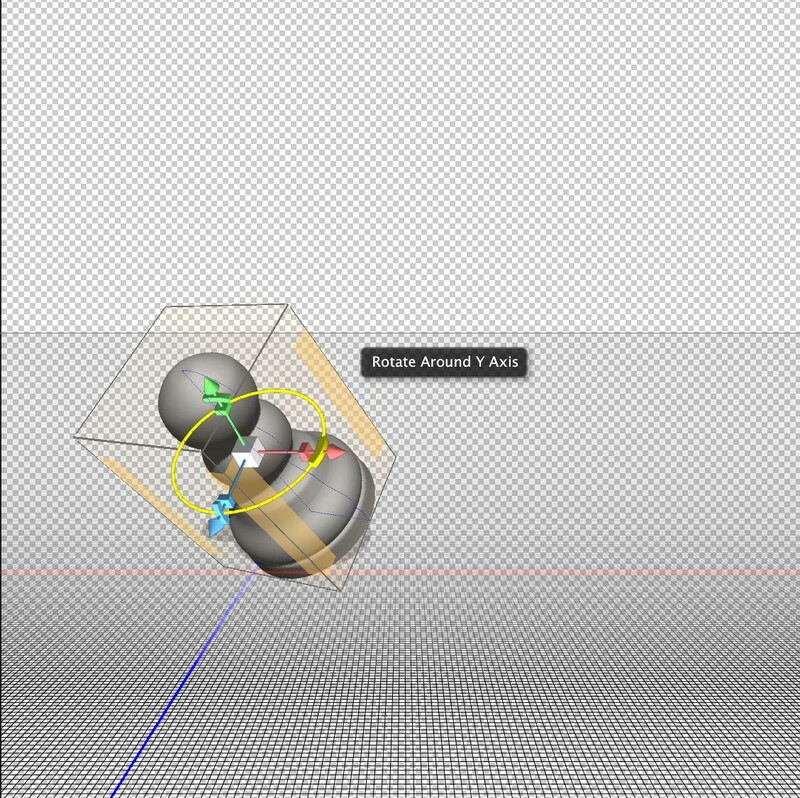 The image above shows the Rotate tool selected. Click and drag to experiment with this tool. You can rotate about any axis but the central point remains in the same position. Notice how the white box at the centre of the image lies directly above the intersection of the red “x” axis and blue “z” axis. This cannot be changed using the rotate tool. This is the roll tool. 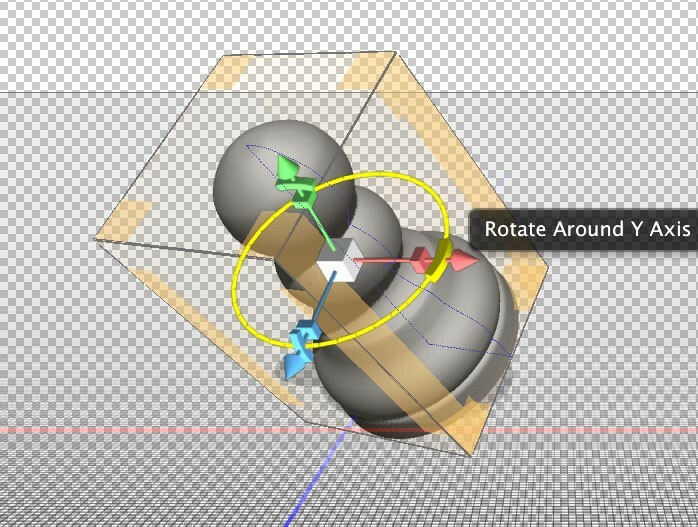 It is similar to the rotate tool, but will only rotate in a plane parallel to your monitor. Because the object was reset before using the roll tool it would be impossible to see the top or bottom of the object without using any of the other tools. 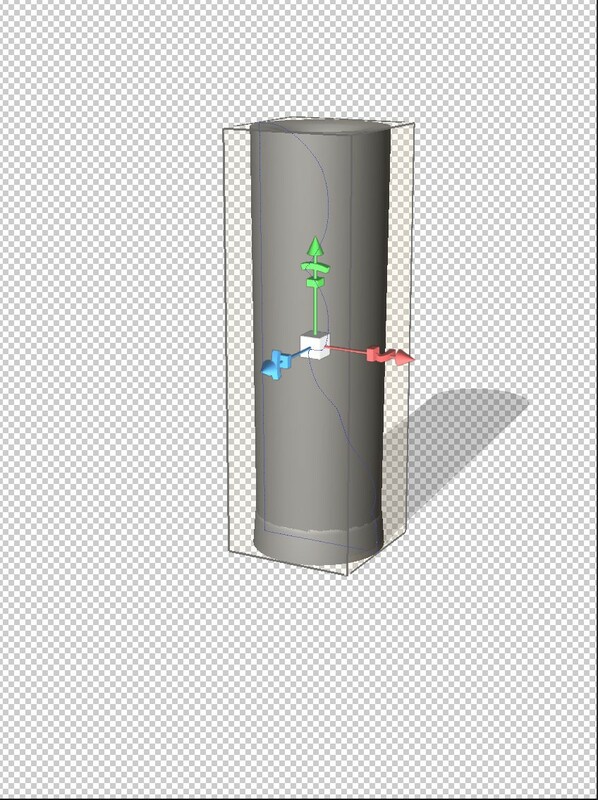 The drag tool allows you to move the object up, down, left and right. You cannot move the object closer or further away. In other words you are moving on the “x” and “y” axes only. 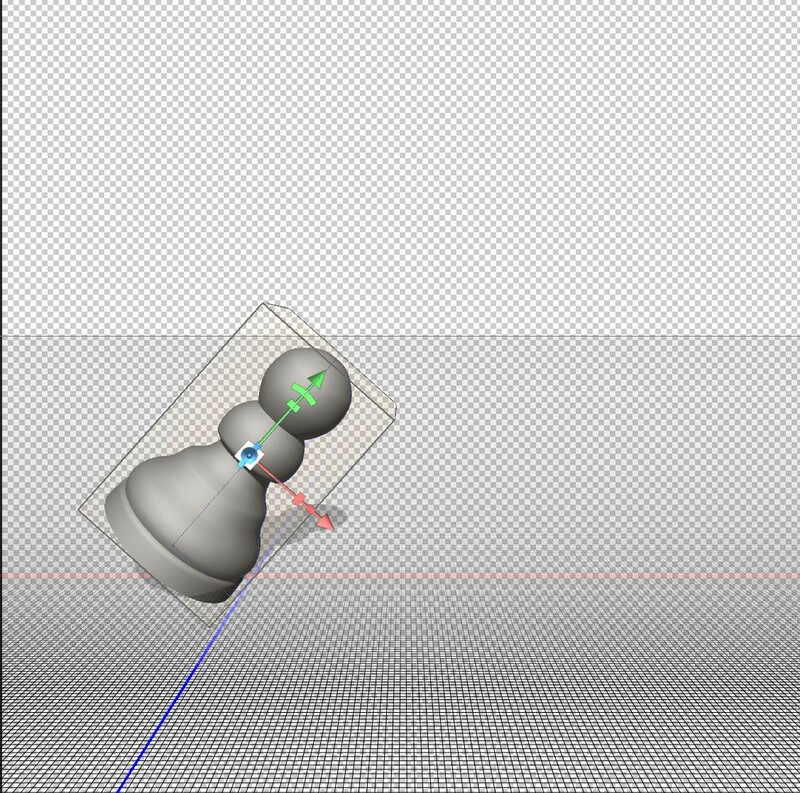 The slide tool allows you to move an object left, right, forwards and backwards. If you start with your object on the ground plane the slide tool will not allow you to move off the ground plane. 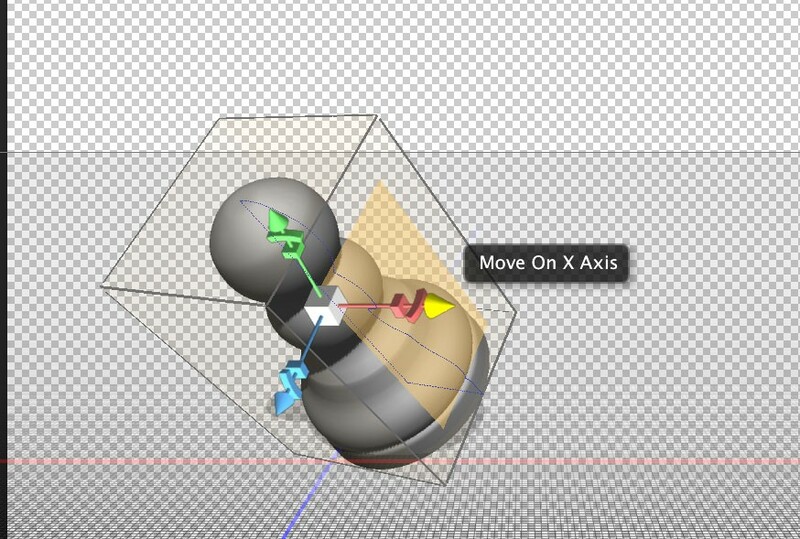 In other word you use this tool to move in a plane at right angles to your monitor. 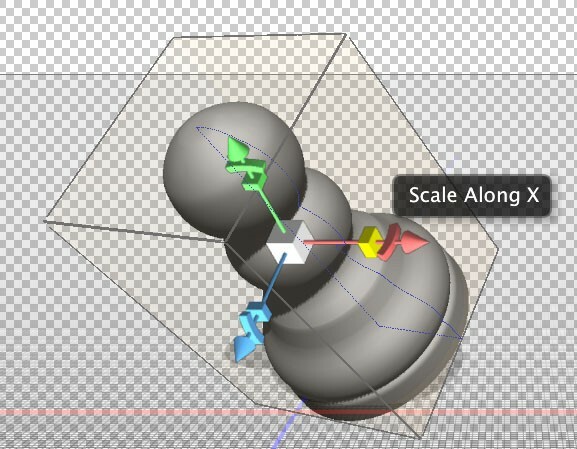 The scale tool allows you to uniformly enlarge or shrink the object around it’s central point. Clicking and dragging up will increase the size, whereas down will decrease the size. The relationship between x,y and z dimensions will stay the same when using this tool. 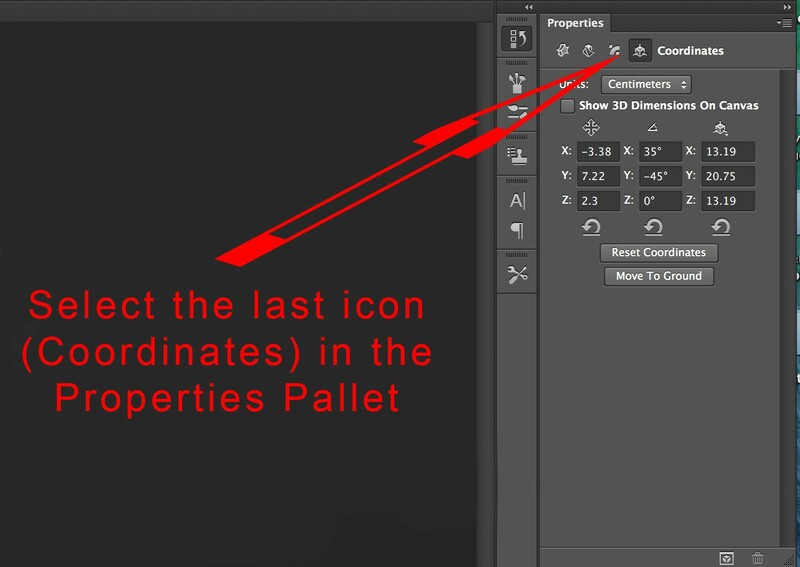 1.Using coordinates in the properties pallet. 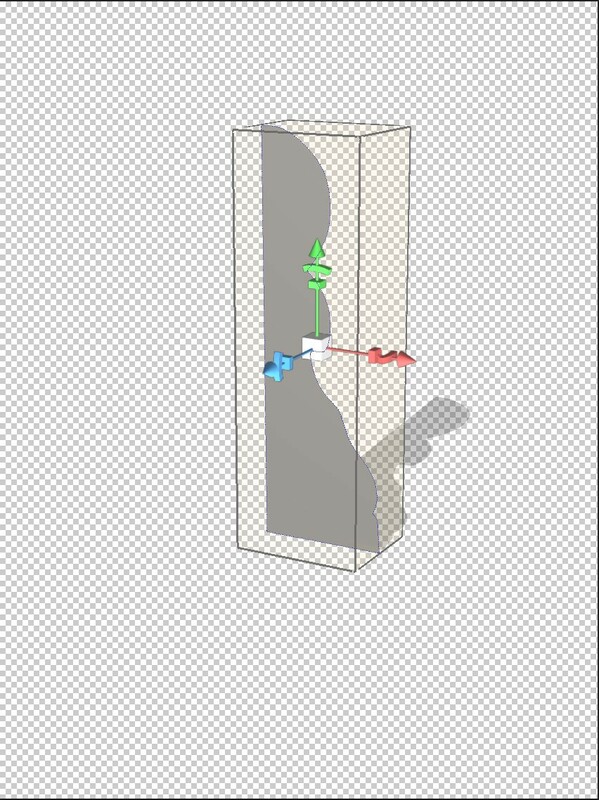 2.Using the red, blue and green control axes in the object’s box. 3.Using the sides and edges of the objects box. 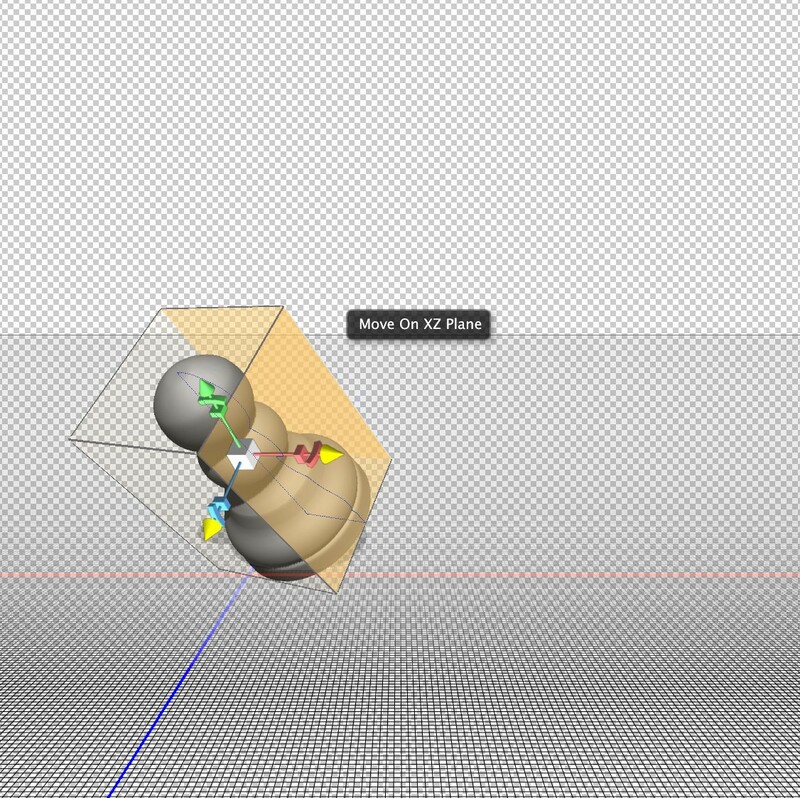 4.Using the 3D move tool options. Next post we will look at moving around within the 3D scene. The object will stay in the same place but be viewed from different positions. With the understanding of move tools gained in this post you will find this quite easy to understand. 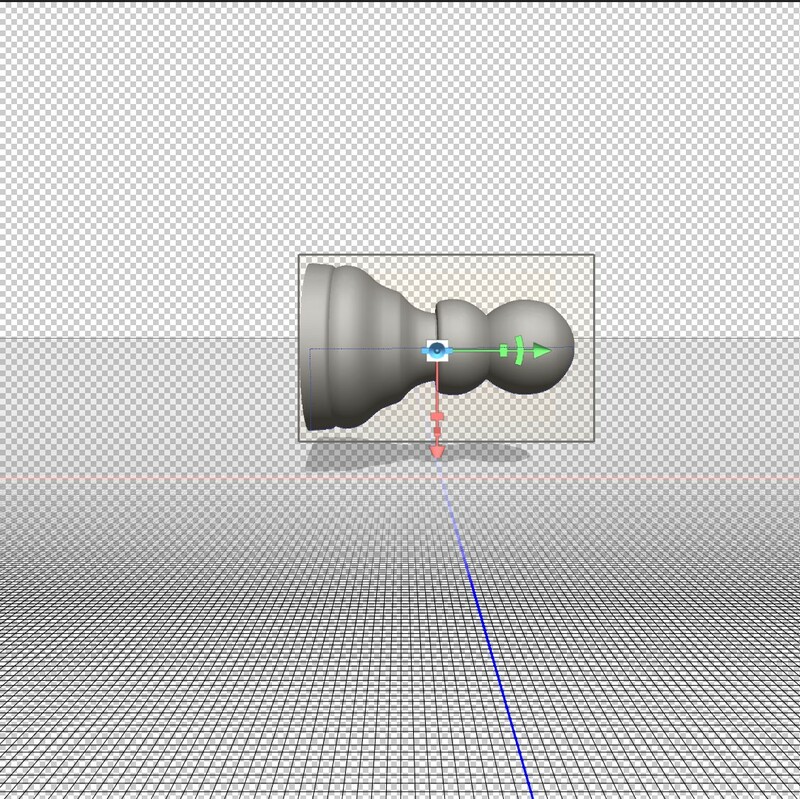 We will also look at creating more of a scene with several copies of the same object moved to different positions. This will allow you to practice what’s been learnt in this post. There are many people who have been working in Photoshop for years, but with the emergence of Photoshop 3D capabilities there is a whole new area to learn. I will run a series of blogs starting with the basics, which will help you gain more knowledge and experience in this area. I will assume throughout this series of blogs that you are reasonably proficient in Photoshop and are using Photoshop cc. There was a time when I hadn’t even considered using 3D objects in retouching. Having access to a huge collection of two dimensional samples to use in my projects I came to realise that a sample shot at the wrong angle and with different lighting was very difficult to fit into the original image if not impossible. If you can create a good 3D object you can alter the lighting, viewing angle, texture and colour so that it will fit perfectly into your image. Photoshop will not replace dedicated 3D software as it is more basic. Having said that, it has a lot of good practical uses. If Photoshop is not capable of creating the object you have in mind it is possible to manipulate 3D objects made in more complex 3D software. Other 3D software can be a lot more complex. I believe Photoshop offers a relatively easy introduction into the world of 3D. In this first Photoshop 3D blog, you will learn how to create a simple shape that has rotational symmetry then learn the basics of moving this shape around and become familiar with the 3D workspace. 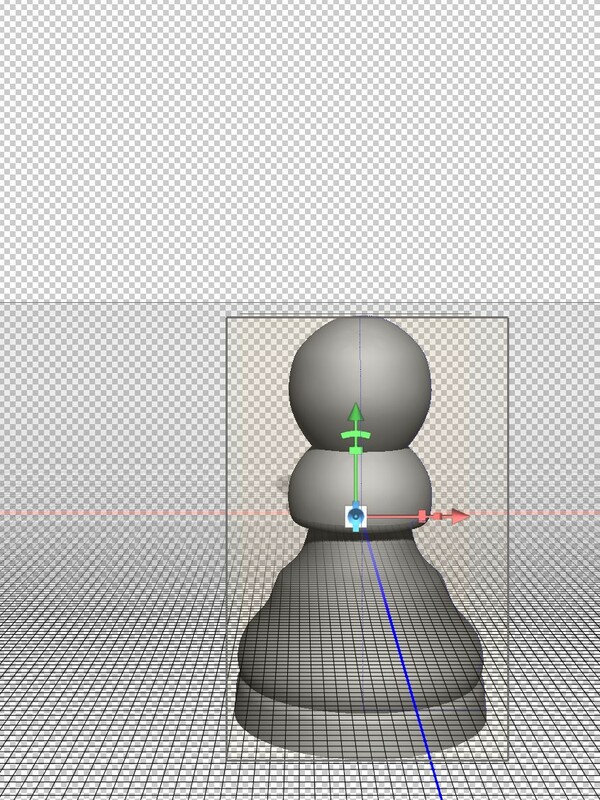 Here’s the image I will use in the tutorial. If you click on this image to see an enlarged version then right click (or Control click) you are welcome to download it for your own use. 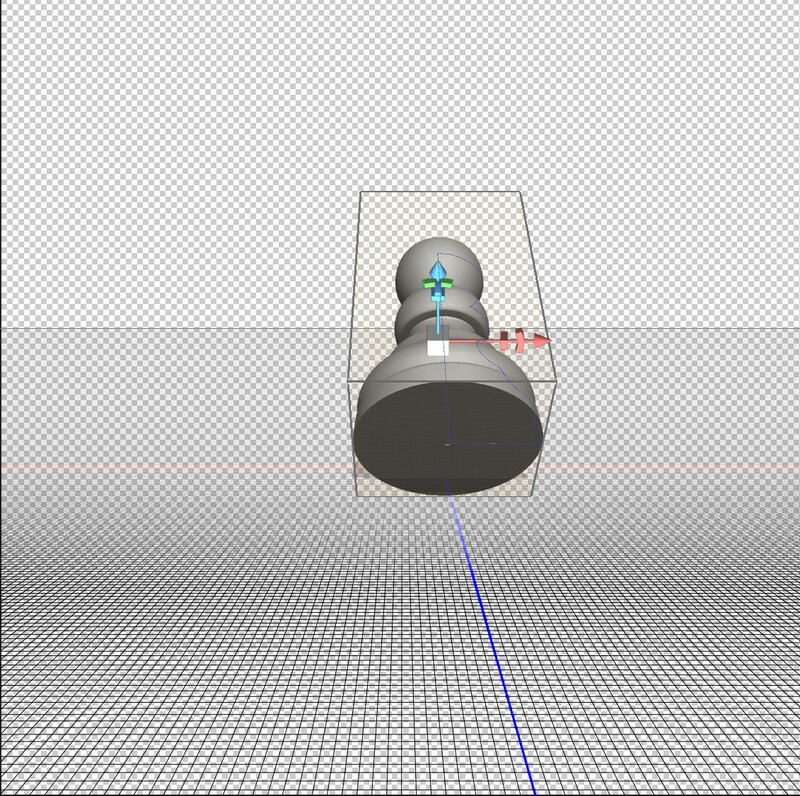 The creation of the 3D object relies on a path so you can also choose to use the principals in this tutorial to draw your own shape and create a 3D object from it. 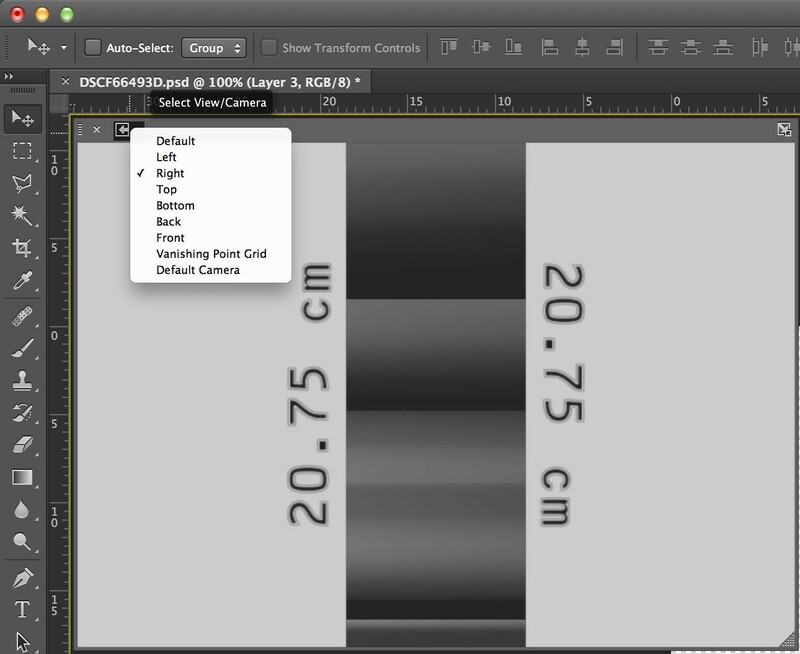 Open your image in Photoshop and draw a path around either the left or right half of it with the pen tool. I have shown the shape of my path in green. This is for illustrative purposes only, as a path is difficult to see. Notice how I have squared off the bottom with a horizontal line rather than following the curve of the base. Also make sure the path is closed i.e. you have to click on your starting point at the end. Unlock the background layer by double clicking on it then click on the eye in the layers pallet so you only see a transparent canvas with the path visible. If the path is not visible you need to select it in the Paths pallet. 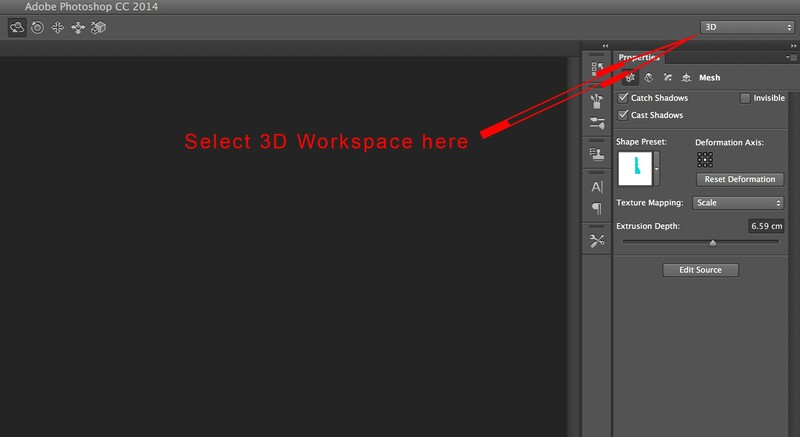 Click in the top right hand corner and select “3D” to enter the Photoshop 3D workspace area. This opens up the pallets you are most likely to use and closes ones that are not likely to be needed. 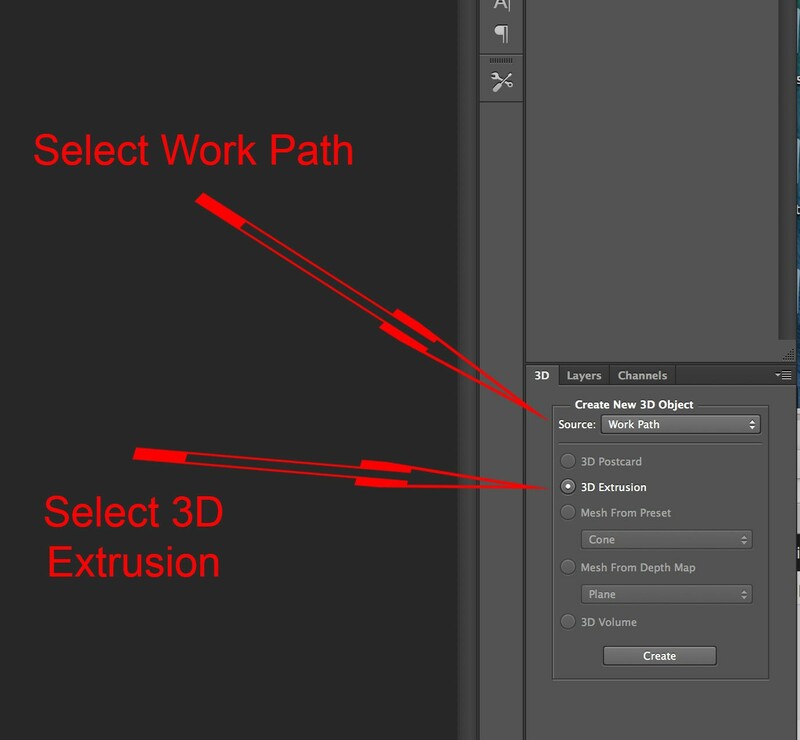 In the 3D pallet select “Work Path” as source and make sure “3D Extrusion” is selected. A Brief Exploration of the workspace. Click in the top right hand corner of the secondary view window to swap the secondary and main views. A second click will swap them back again. Swap main and secondary views. You can close the Secondary View window by clicking on the cross in the top left hand corner if you prefer a less cluttered workspace. If you wish to show the secondary view window again go to View>Show>Secondary View. Notice how the 3D object lies on the ground plane on the intersection between the red and blue lines. Also the default light has been moved. The light itself cannot be seen, but the shadow has not changed in relation to the background. The 3D object is no longer on the intersection of the red and blue lines, and is floating above the ground plane. The important point is that the same tools are used to move the 3D world and objects within that world. You need to make sure you know if it’s the object or whole world that is selected. I would encourage you to experiment with these. We will have a more detailed look at them in next weeks blog. 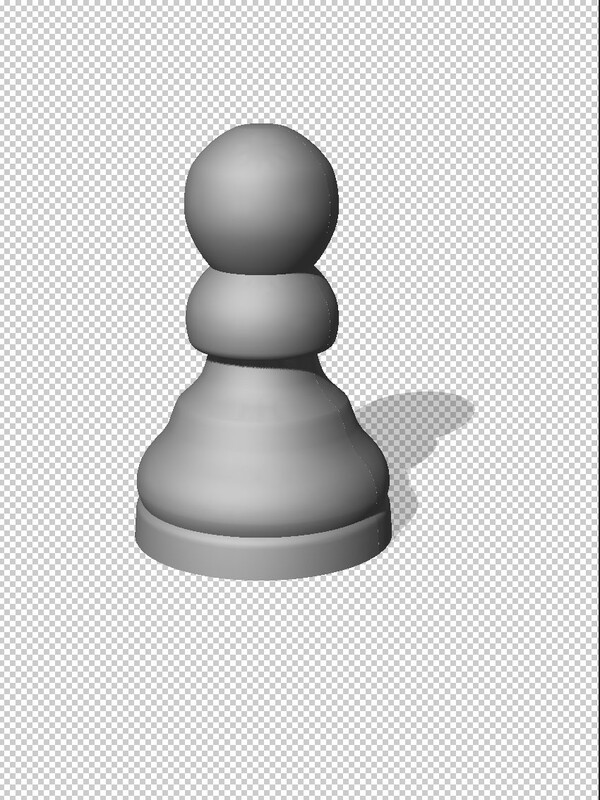 You will now create a 3D pawn as it would appear on a chess board. This may be simpler than you think. Notice the object has a box around it with move options indicating that it is selected. 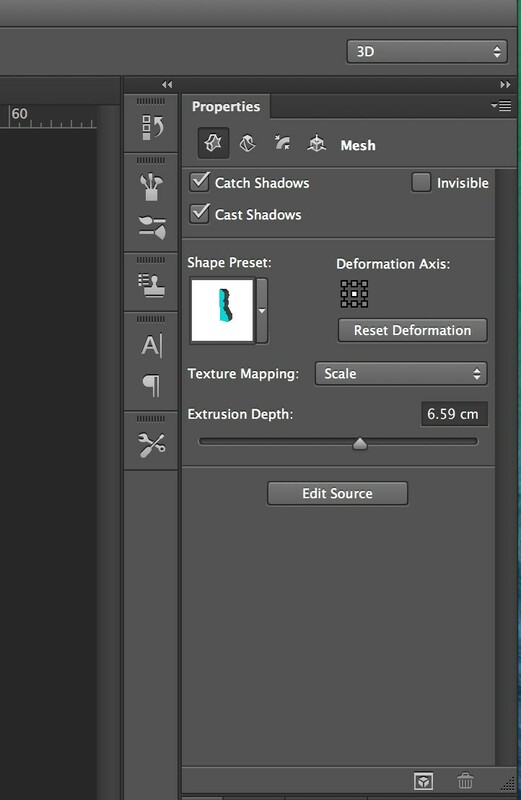 Your properties pallet will not look like this if you do not have your 3D object selected. 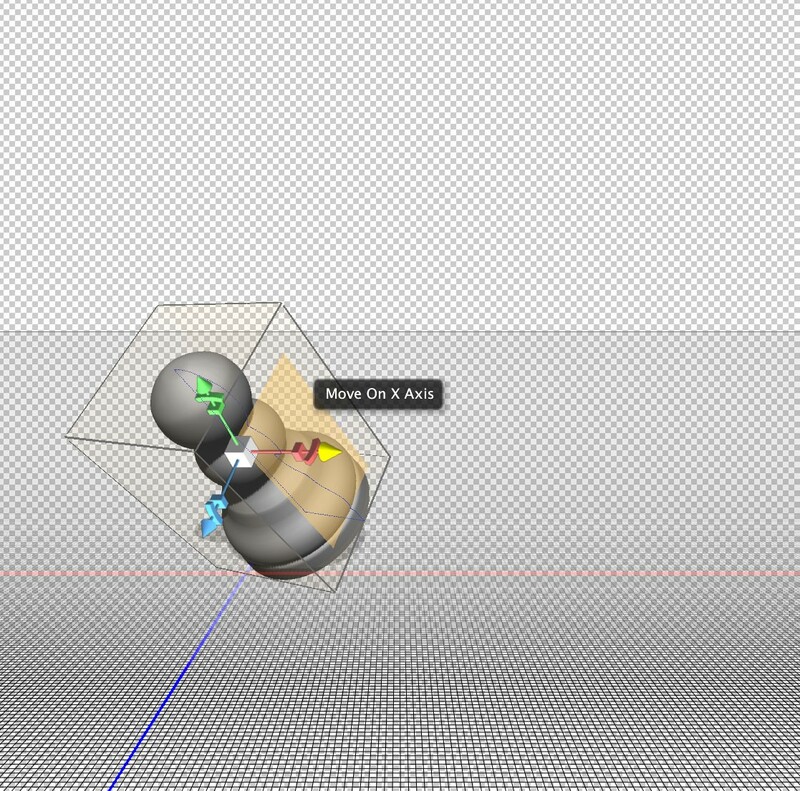 You now need to make a 3D object by rotating about an axis. Second set of options in properties pallet. 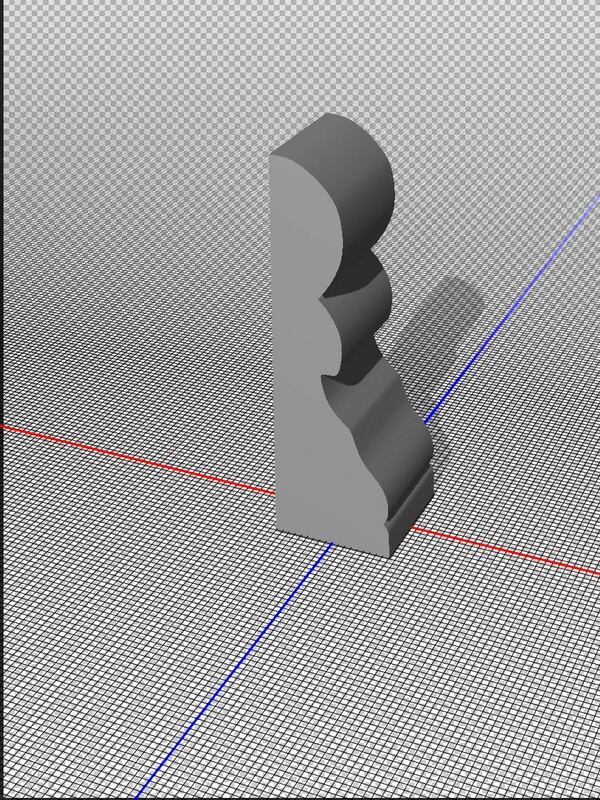 Notice that you can alternatively change the extrusion depth here. 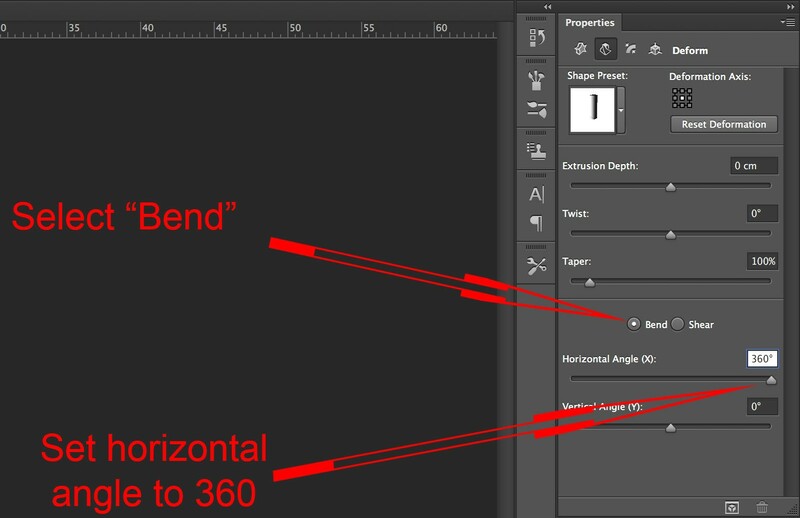 In the lower half of the Properties pallet select “Bend” and change the “Horizontal axis (x)” to 360. 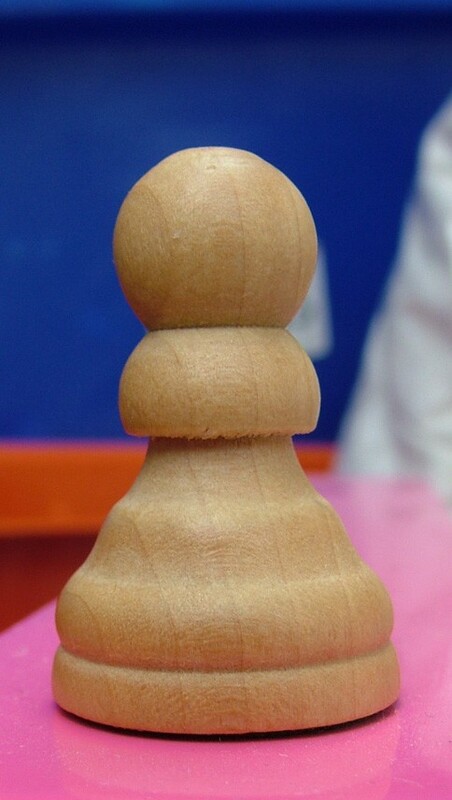 This object is created by rotation about a central point. You need to change the point of rotation to the left hand side. First set of Property pallet options. Notice the highlighted central square in the “Deformation Axis” area. 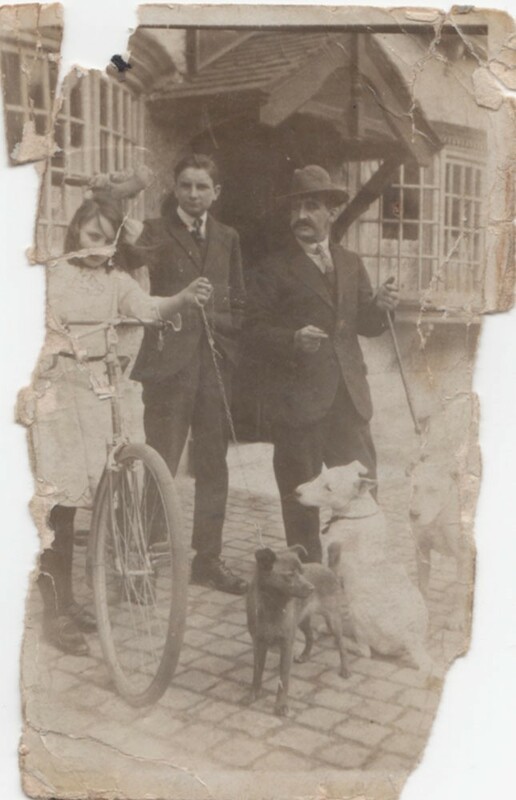 Click on the square shown. You have now changed your rotational point to the left hand side, and your image will look like this. Rotation about left hand axis. When creating objects in this way think of things that have rotational symmetry. Other possibilities are bottles, plates, wine glasses or bowls. There’s a lot more to learn on the subject of Photoshop 3D. I think there is a lack of ready available knowledge of the basics. It is very important to learn these before moving onto more complex ideas. If you use the ideas here to create your own objects you will become more familiar with the concepts. Next week we will look at moving in the 3D space. 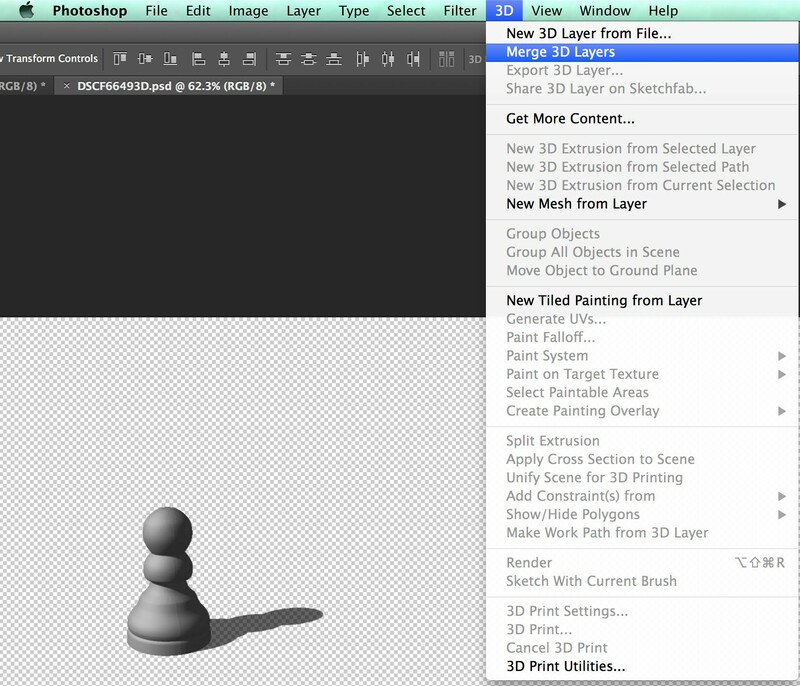 I hope this has been of help if you are new to Photoshop 3D and have fun using these ideas!